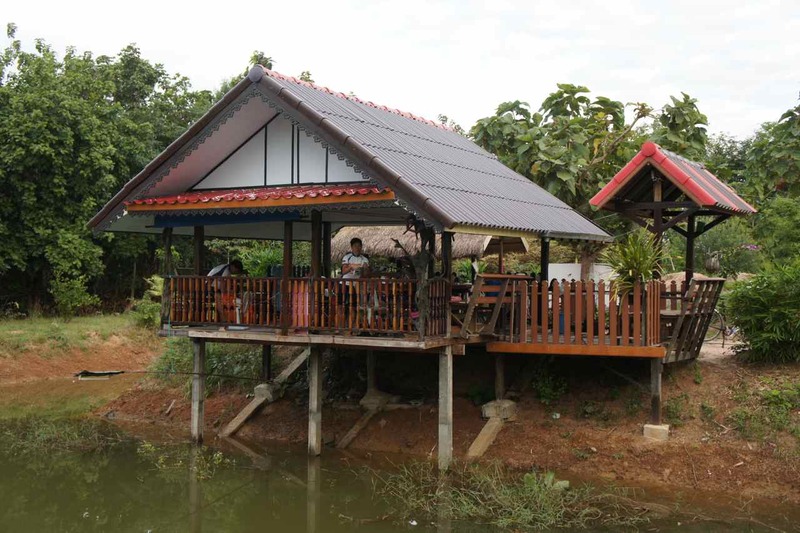 Thailand is home to many Swedish nationals and one thai-swedish family in Udon Thani who follow our blog invited us to come and stay at their house. After having left the checkpoint at the border we decided to hurry to Udon some 55 km further south. Chawee and Sven welcomed all three of us and brought us to a restaurant to meet some more people in the Swedish community in Udon. We have met less Swedish people along the way than we expected so it was great to meet some Swedes again. 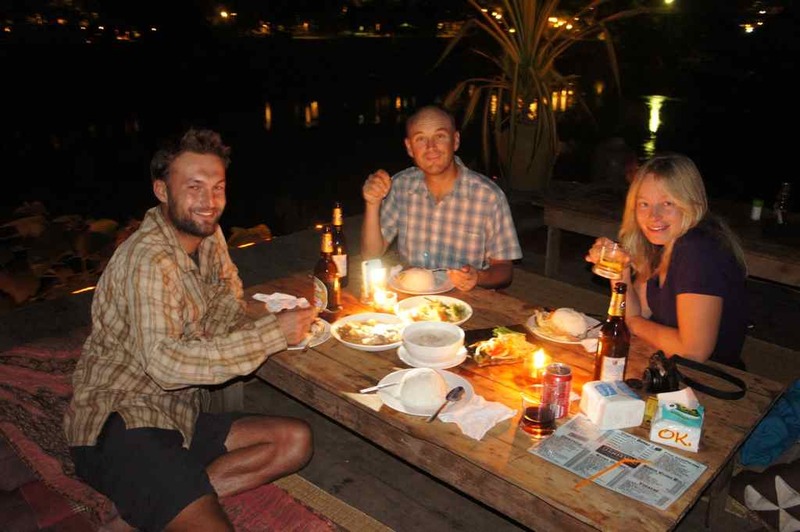 Loy Krathong is a traditional festival that is celebrated during full moon in November in Thailand and Laos and probably some more neighbouring countries. 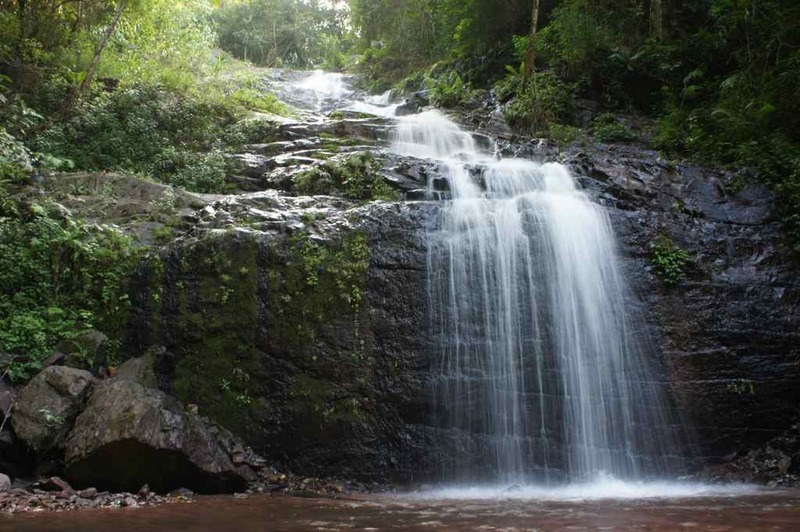 In thai the word for river is literally translated as ”mother of water” and the festival is celebrated to thank the mother of the water for the water that she lets us use. Small and beutifully decorated floats carrying flowers, candles and joss sticks are released on the river. It is a very beutiful sight to see a river that is lit up of thousands of such floats. We stayed with Chawee and Sven for two nights and when we left the first thing to do was to cycle into to downtown to try to buy a road map and reactivate my thai SIM-card for my iphone so that we can navigate by using google online maps. 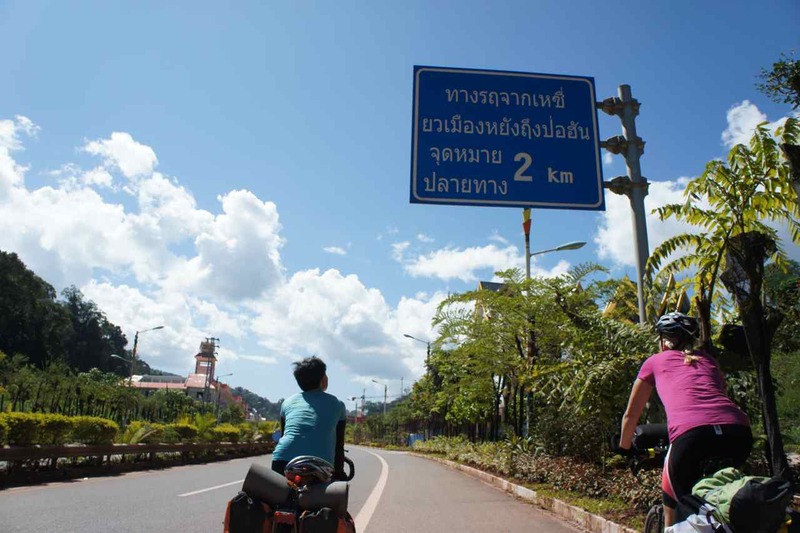 It wasn’t hard to find our way out of Udon – what was hardest was to get three people to agree on which way to take… Once outside Udon our plan was to stay away from the big roads and try to spend as much time as possible cycling on the small back roads in Isan (Thailand’s northeastern region). 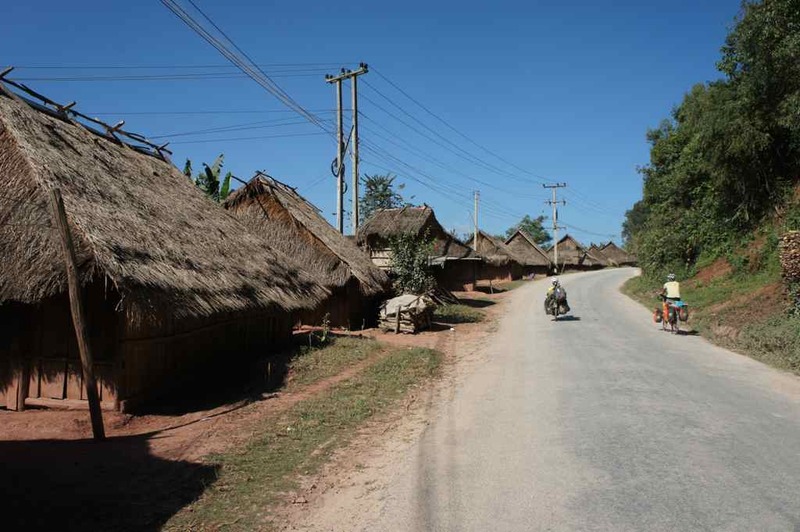 We cruised across the Isan landscape and passed numerous small villages. The small road got smaller and smaller and soon we found ourselves on a narrow dirt road which surface was covered of a very soft mix of dust and sand. It was a bit tough but when we wanted to complain we reminded each other that 30 minutes in sand is nothing compared to the endless days we spent fighting the loose sand in central asia….. Soon we realized that we wouldn’t be able to get as far as we had planned to and when we cycled into a village we decided to stay there. 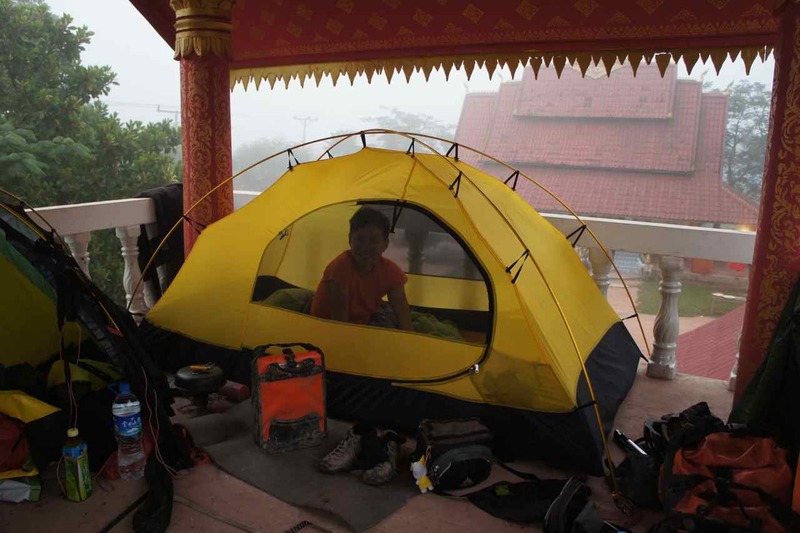 There was a temple and a school that would provide good camping opportunities, but we decied to ask around anyway. A shopkeeper told us to go to the ”phuyai baan” – village headman (head woman in this case) who had a big field behind her house. Even if it is winter in Thailand now the afternoon sun is still strong and we try to start as early as possible in the mornings. The family told us which way to go but warned us that the road was bad. It was indeed a dirt road, but the dirt was packed and we had no problems to cycle. After 2-3 hours a steady northeastern wind picked up and since we were mainly going south or southwest it was going to be our day…. 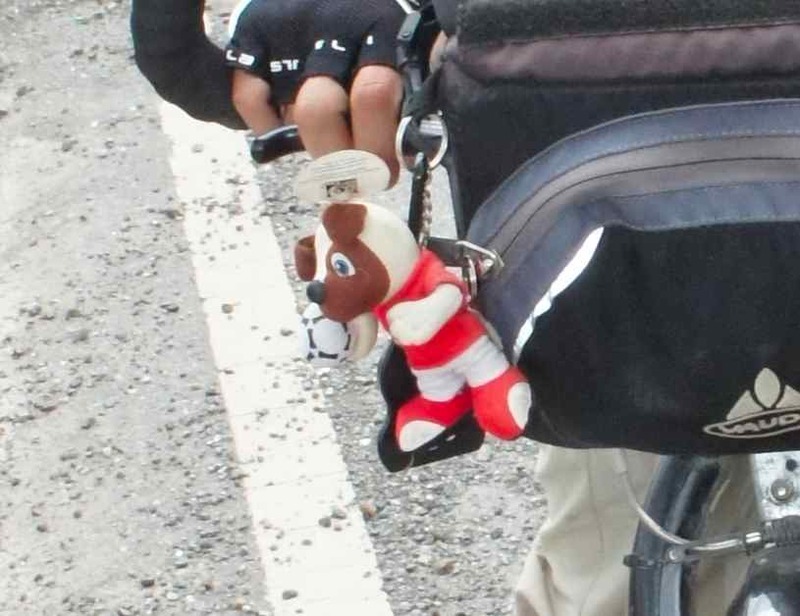 P’Ben has a tiny little MP3 player mounted on his handlebar and it contains lots of classic thai hits. 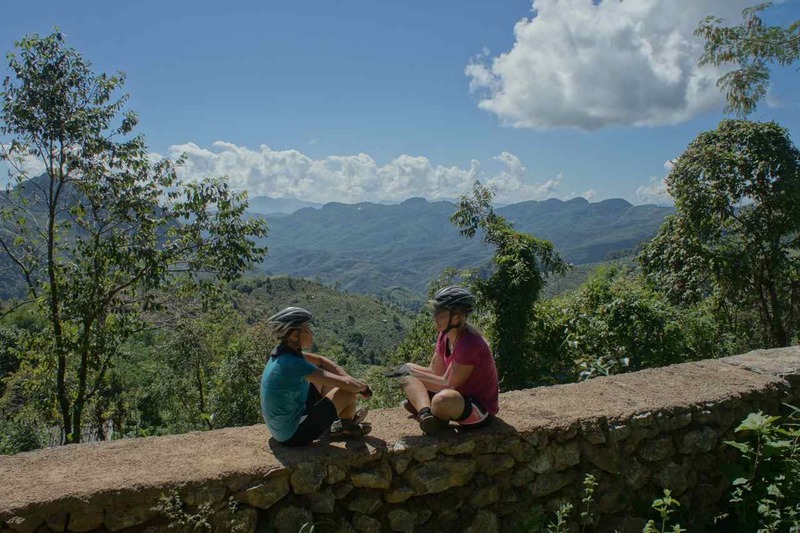 A flat beautiful landscape surrounded by hills, golden fields, no traffic, tailwind and thai hits from the time I was first in the country – could it be any better…? We talk too much and cycle too little and didn’t make it to where we had planned to the second day either. 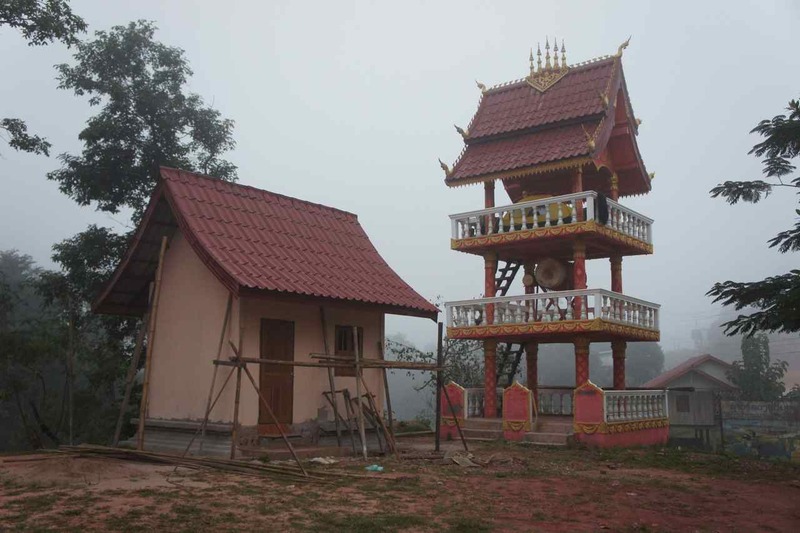 When we approached the small town of Baan Taen we decided it was time to stop for the day. People in villages we had passed on the way told us there would be plenty of accomodation in this town. We found one simple hotel that was full and when we continued through the center we cycled past the local police station. 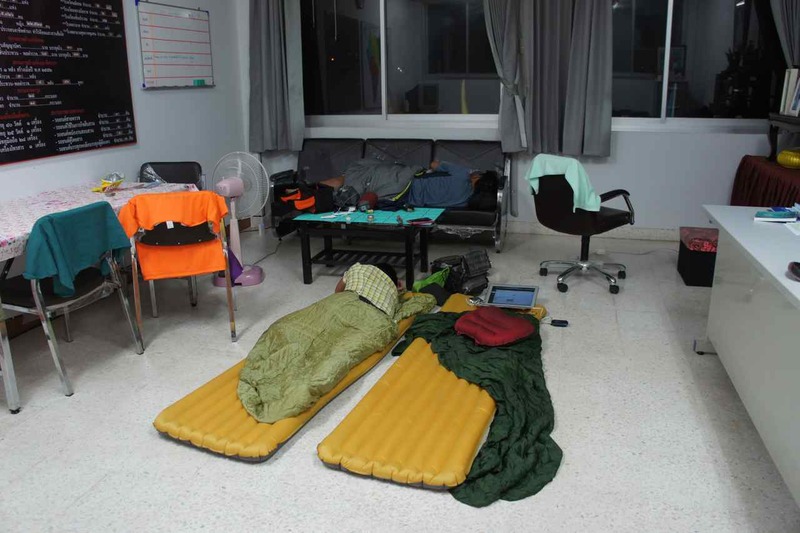 Wej and P’Ben have stayed at police stations before so we went in to ask if we could pitch our tents on their lawn. The officers said it was OK to stay on the lawn but thought that we would get a better sleep if we stay inside the station instead. We accepted that kind offer, and no – we aren’t staying in the arrest – we are staying on the floor in the police chief’s office using his internet connection to update this blog post…. This entry was posted in Posts in English on November 20, 2013 by admin. It was a morning that was just like any other morning when we stay at a hotel. We went up early, packed our stuff and loaded our bikes. But there was something different – it was the last morning on foreign soil. 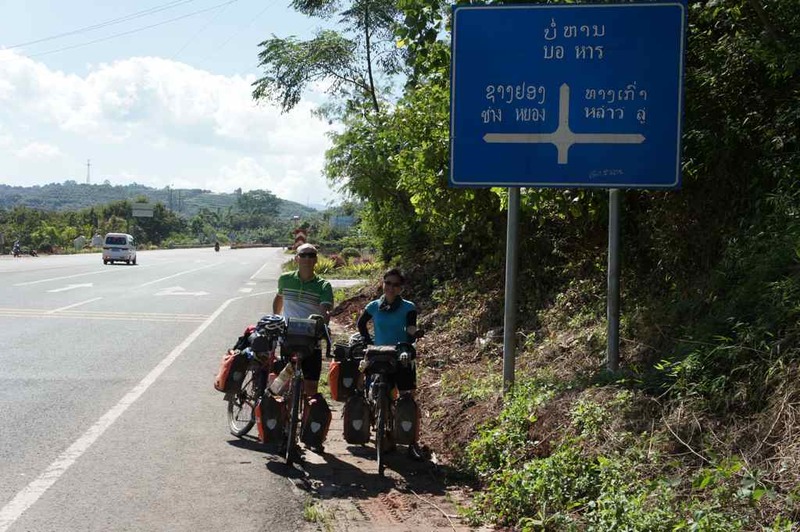 Although we have spent the last days in an environment that is very similar to Thailand, spoken Thai most of the time and seen Thailand on the other side of the river, we were very happy but also nervous when loading our bikes to ride the last 20 km to the border crossing. Crossing into Thailand would be our 14th border crossing and we stuck to the same routines as usual. Try to get rid of all remaining currency before leaving and we did this by having a wonderful breakfast of grilled baguettes and traditional laotian coffee. The ride to the border checkpoint was smooth and took less than an hour. We were wearing our brand new cycling jerseys and we felt like a small professional cycling team in our uniforms…. The border procedures were dealt with quickly. 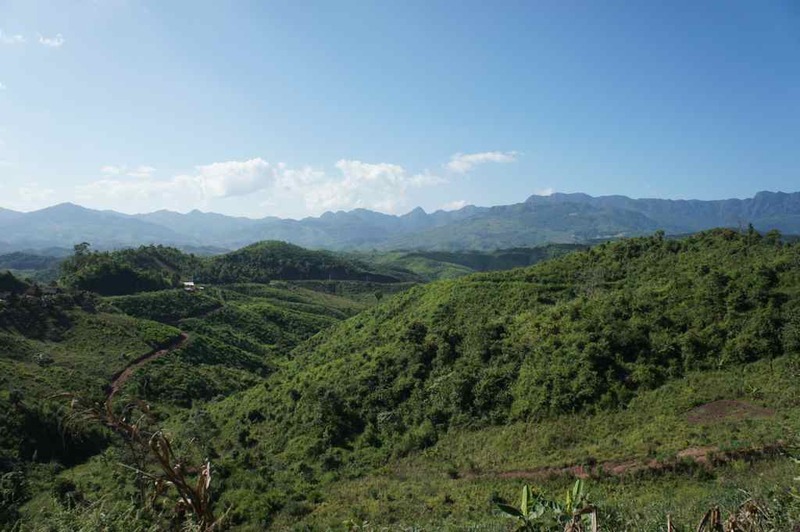 In this photo I have entered no mans land while Wej is still technically in Laos. All the countries we have cycled through have been countries where you drive on the right hand side. 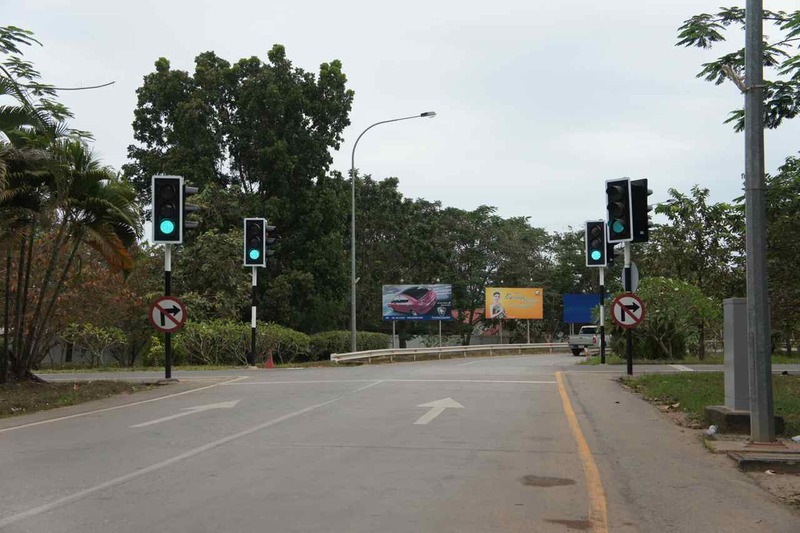 In Thailand the traffic is on the left hand side and right after the border check point on the Laotian side, there is a strange intersection where the lanes cross each other and the traffic continue on the left hand side. Intersection for changing from right hand side traffic to dito left. We passed the border on Saturday at 10 AM and there was not many cars at all. We didn’t bother to wait for green light and carefully crossed the intersection against the red light. We had been warned by local cyclist about the train tracks on the bridge. They had told us they are very dangerous, but we are used to tram tracks in the midst of the streets in Göteborg and didn’t think a single train track was much to worry about. Wej smiling as she crosses the actual border in the middle of the Mekhong river. At the end of the bridge on the thai side. 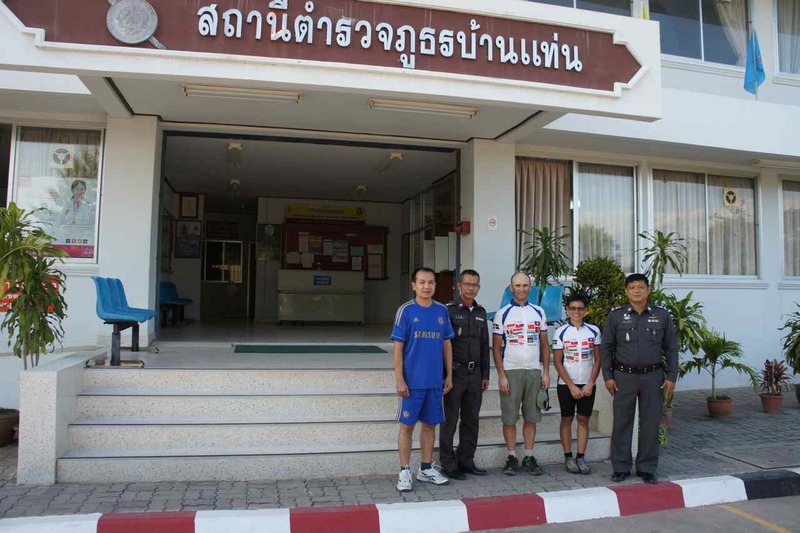 Our cyclist friend P’Ben had taken a night train from Bangkok and met us after the border checkpoint on the thai side. He had ordered a grilled baguette and the delivery lady came with it all the way from Sweden. 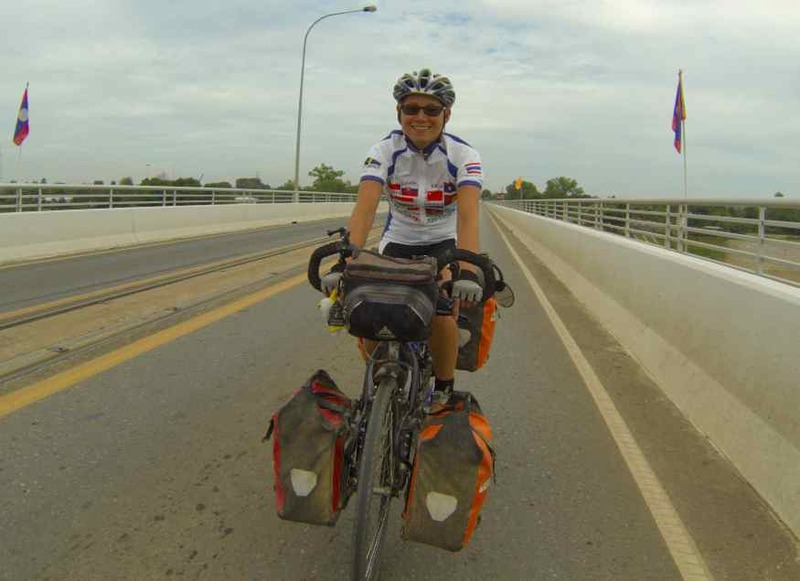 We will cycle together most of the way to Bangkok and try to re-live some old cycling memories together. This entry was posted in Posts in English on November 18, 2013 by admin. When Greta’s flight passed over our guesthouse I was busy cleaning and checking my bicycle. It was nice to get back its original colours from underneath all the layers of dust from northern Laos and south China. What wasn’t as nice was to discover a broken spoke in my rear wheel, but I am glad that I discovered it then and not when we were packing to leave the following morning. The two broken spokes I have previously got on this tour have both occured when hotel staff have moved my locked bike without lifting the rear wheel. I don’t know if this was the case this time, but at least I got to practise how to change spokes and true a wheel without proper tools. 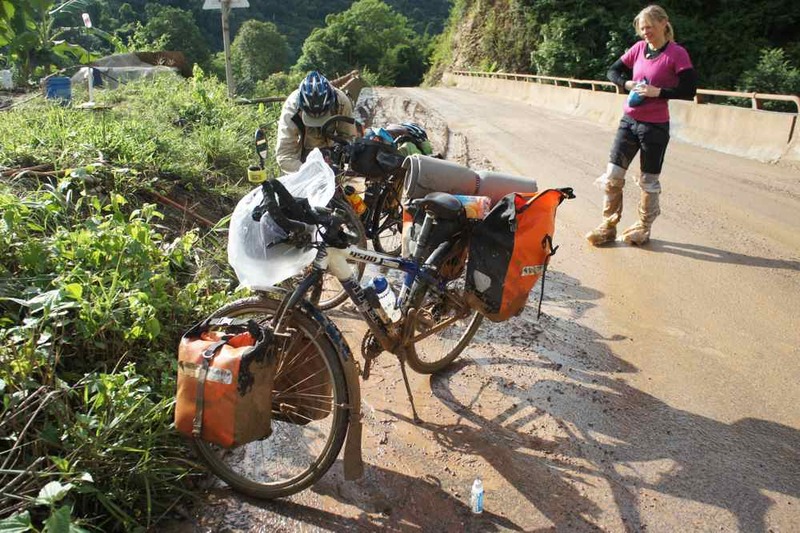 We have read many blogs telling about how hard it is to cycle in Laos. 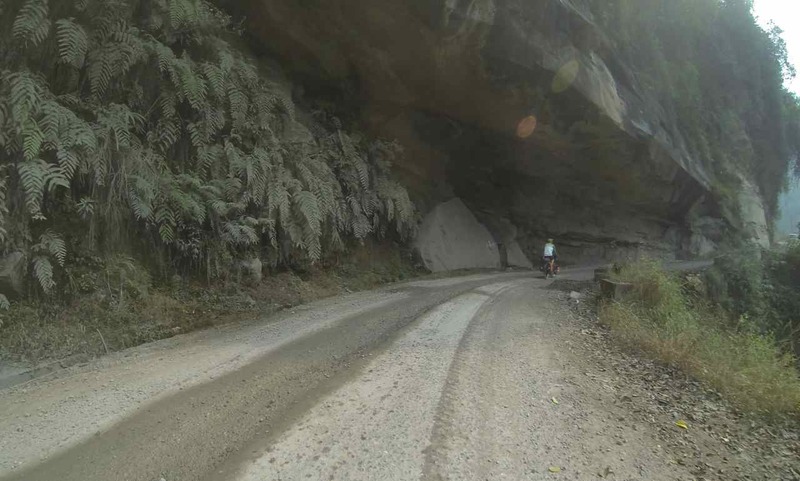 The road is supposed to be bad, the mountains tall and steep and the temperature like a pizza oven. 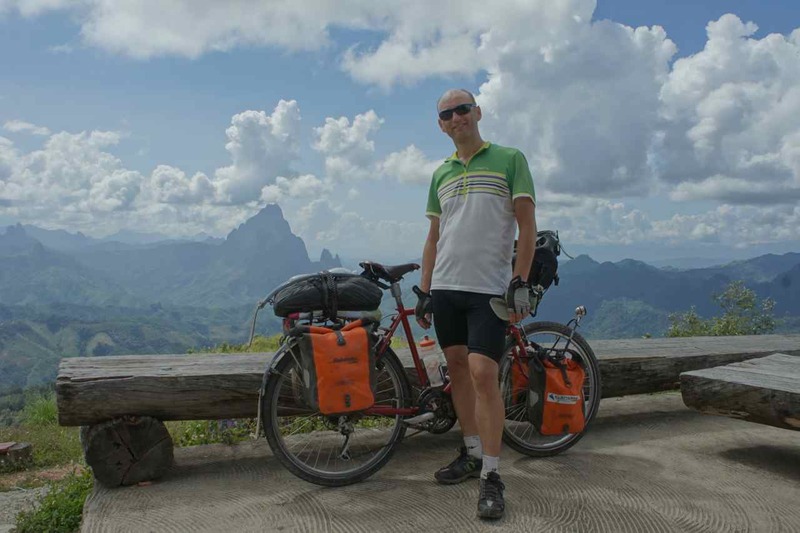 When cycling towards Luang Prabang we started to think that those accounts were severely exaggerated – we started to think that cycling through Laos was like a walk in the park…… Then came the climbs south of Luang Prabang…. In the deserts of western China we could tick off our first no.2, i.e. +200 km in a day. 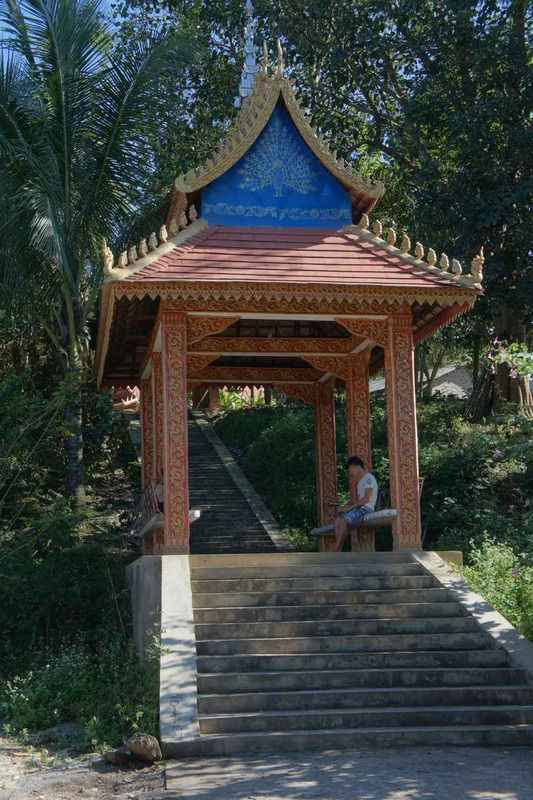 On the first day after leaving Luang Prabang we could tick of the second no. 2 which is climbing more than 2000 meter in a day. After uphill comes downhill and the following day was going to be fun. That was at least the plan until I woke up in the middle of the night and felt all my joints were stiff and my back was aching. All of these are classic symptoms that tell me I will soon get ill and when I woke up in the morning I didn’t feel well at all. It took ages for me to pack my stuff and we delayed our departure a couple of times until we around mid day decided to not cycle. I went back to bed and spent the rest of the day sleeping or reading my book. I need to apply for a visa to Thailand and since it takes two working days and we have decided to cross the border on Saturday I had to apply no later than on Thursday morning. The unplanned restday wrecked our plans of a nice and gentle ride towards Vientiene and now we had to speed up in order to make up for lost time. I felt much better after resting for a day but I was still a bit weak. The aim was to cycle 150 km to the town of Vangvien. It went well for about 100 km but when my speedo showed 110 km I completely lost all my power. We stopped at a shop at the far end of a small village to buy a softdrink and discuss what to do. I got knocked out and slept for an hour behind a shop. Going back is never an option but I would have needed a pack of hungry wolves behind me to muster enough energy to ride the remaining 35 km. It wasn’t simply going to work. Wej who is a master of communication had already started a conversation with the young lady running the shop. Without telling me she asked the lady if we could pitch our tent somewhere near her house which was behind her shop. The answer was ”no, it’s not necessary because you will sleep in our house tonight”…. The family then fed us and prepared mattresses for us to sleep on in their living room. Meeting complete strangers like this is the best part of this trip and here in Laos it is even better since we are able to talk directly without using dictionaries or body language. Having dinner in with our host family. Their house is still under construction and will be wonderful once it’s completed. 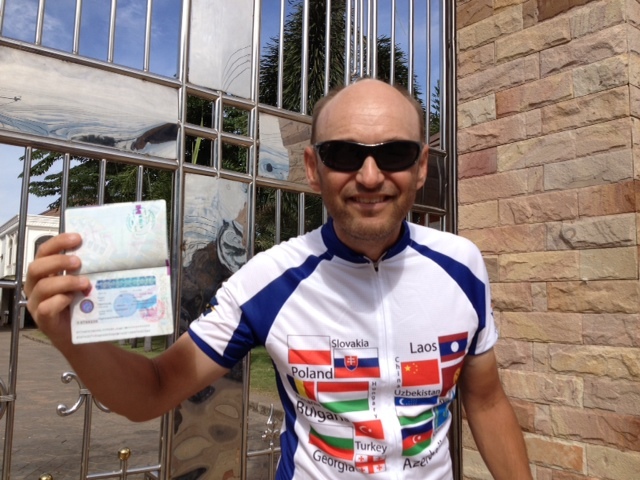 We were still delayed and it was almost exactly 200 km from our host family’s house to the Thai embassy in Vientiene. It could be possible to cycle in a day but the sun sets so early now that there is simply no time to ride that far before it gets dark. 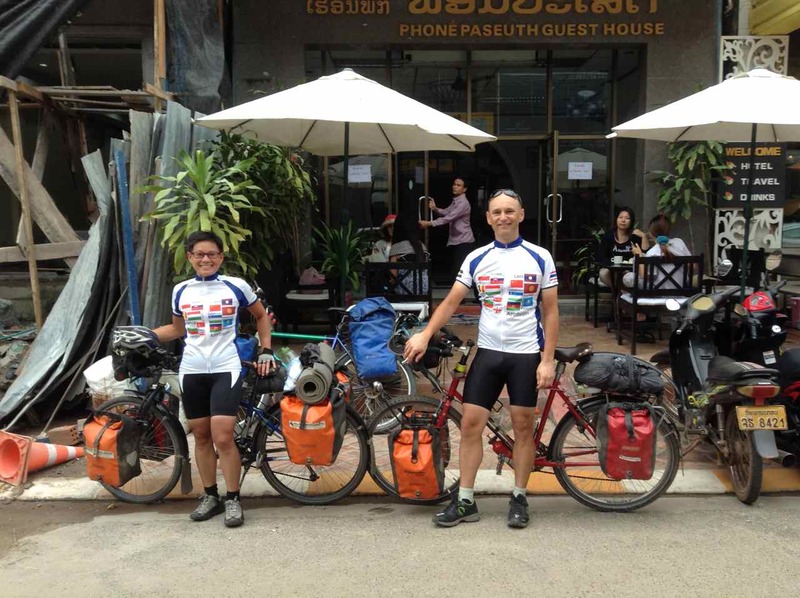 Our plan was then to ride as far as possible or at least 150 km and do a very early start on Thursday in order to make it in time to the Thai embassy. When we set out in the early hours it was still misty and a bit cold but as soon as the sun came up, it chased away both the mist and the nice temperatures. We stopped to have breakfast in Vangvien which is a famous tourist town. At 17.00 we saw a nice looking motel. We still had about 35 minutes to sunset, but we were satisfied since we had reached within striking distance to Vientiene so we decided to check in at that motel. The place looked good and had a huge garden, but there was nobody there and we were close to giving up when someone finally turned up. Investing in a nice motel but not have any staff to take care of guests looks to me as a recipe for a future bankruptcy. 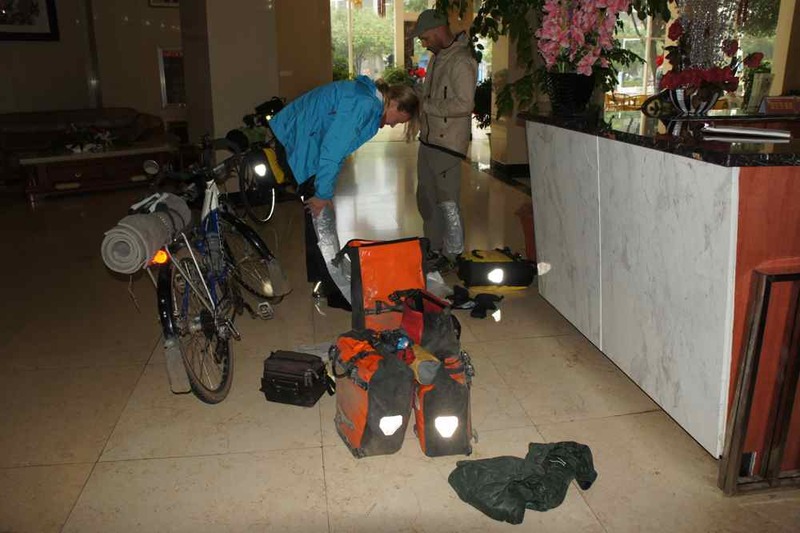 Our bikes were loaded at 5.45 the next morning and we set out in complete darkness. The dawn came not long after and at 6.15 it was full daylight. 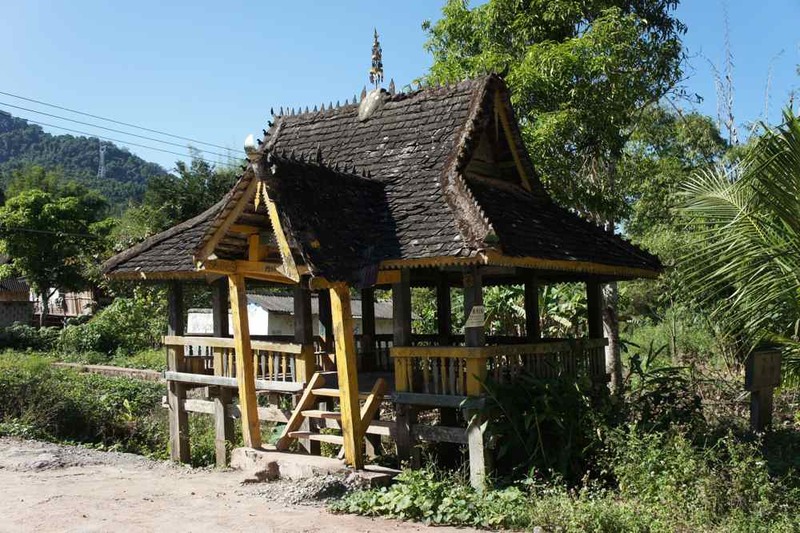 Laos used to be a french colony and being a colonized by foreign masters must be national tragedy on an astronomical level but at least there was one little small advantage in being colonized by France – the ”khao jii”. 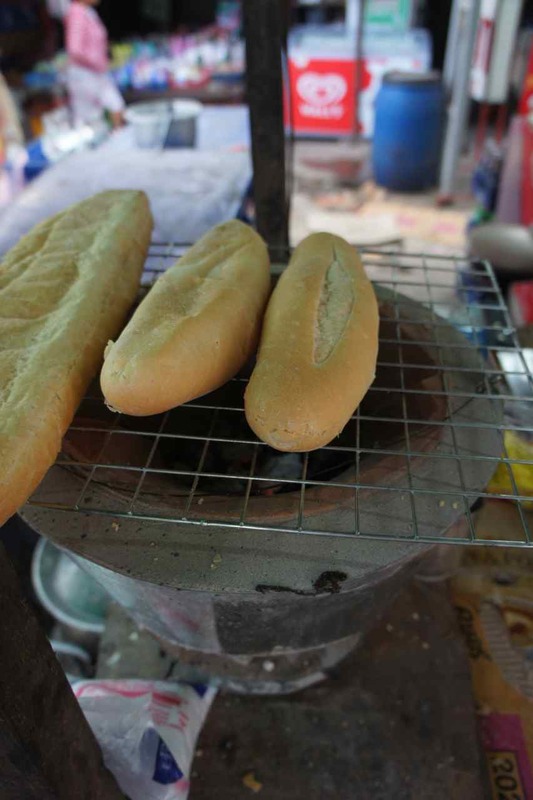 Think of a freshly baked french baguette, think of it grilled over a charcoal fire and filled with yummy indigenous laotian fillings such as sweet hairy pork (moo yo), pork paté, coriander and spicy sauses. 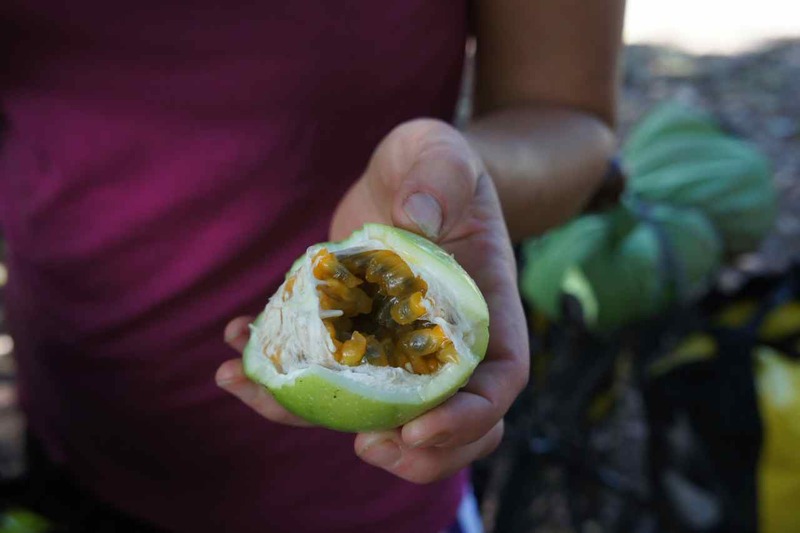 It is a perfect mix of local cuisine and french baking traditions. We had it every morning when we visited Vientiene 8 years ago and when we arrived in Luang Prabang we wanted to have it again, but in Luang Prabang they don’t grill the baguettes first which is a major mistake that won’t make them anywhere close to as tasty as the grilled ones that are for sale here in Vientiene. 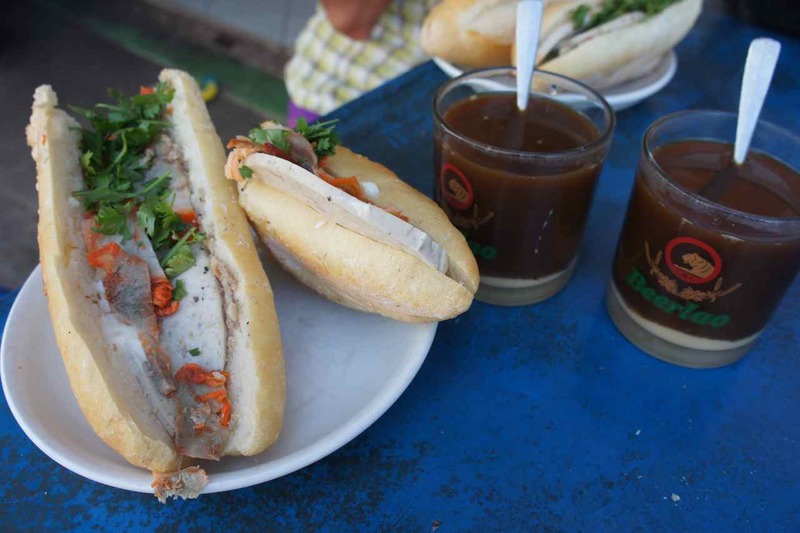 A ”khao jii” baguette should be grilled on the spot and served with the very strong and sweet Lao coffee. We have enjoyed it every morning we have been here and it is a reason in itself to some day return…. We made it in time to the Thai embassy and today I got my passport back endorsed with the last visa and we are prepared to cross the 14th border into the 15th and final country of this journey. 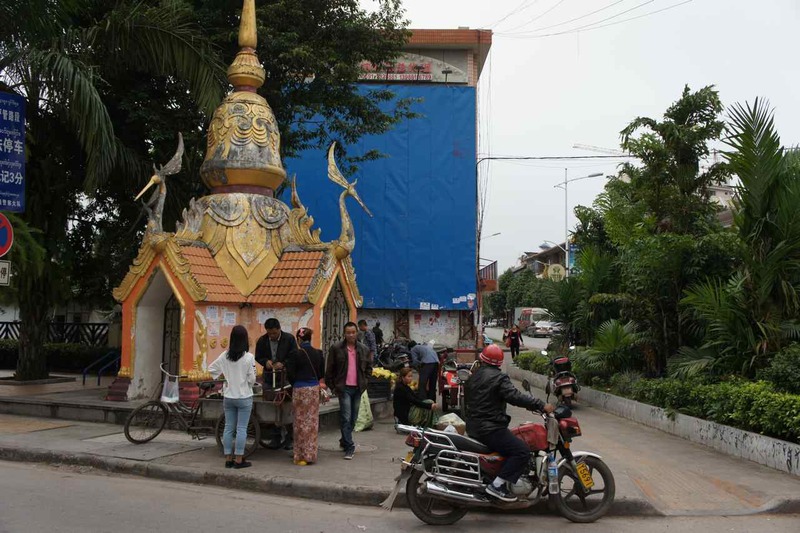 And being in the fourth capital city on this tour we had to get the photos taken in front of its most wellknown landmark, the Pratu Xai…. We try to carry a minimum of equipment on this tour and I think all of you have seen my white and green cycling jersey so many times now that you are fed up with it. Well think of me then… It’s the only one I have and I have been wearing it almost every cycling day since Bulgaria and I have handwashed it in wash basins in public toilets, streams, lakes, showers or anywhere else where there has been some running water, but rarely in a washing machine. Our dear N’Arm and her friend Kong have designed the logo that is on our business card and now they have even designed new cycling jerseys for us. We got them delivered to our hotel this morning and we are more than satisfied and owe both of them a big thank you. 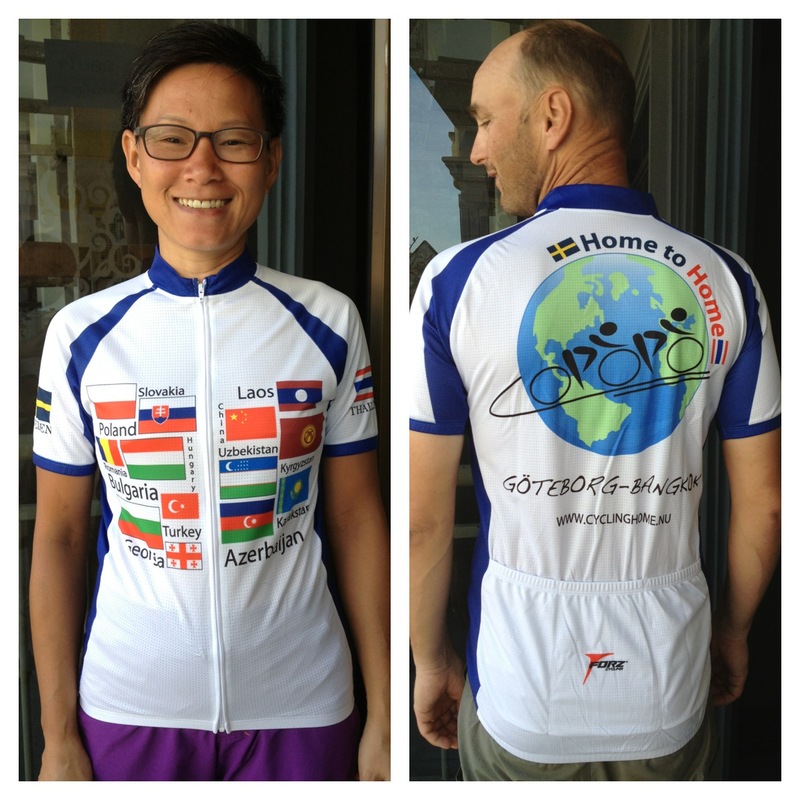 We will wear these cycling shirts with pride from tomorrow morning when we cross the Mekhong river into Thailand and all the remaining way to Bangkok. This entry was posted in Posts in English on November 16, 2013 by admin. This entry was posted in Posts in Thai / โพสต์ภาษาไทย on November 14, 2013 by admin. The staff of the exchange organization picked up me and my two fellow swedish exchange students, squeezed us into a small car and drove us to the arrival camp for the foreign exchange students. My first impression of Bangkok was it was a huge and crowded city with a messy traffic situation. The glittering roofs of all the temples we passed by seemed very exotic to the young and unexperienced version of myself and when we stopped to have some snacks along the way the smells and the atmosphere at the food stalls added to this feeling. I truly enjoyed my exchange year even if it occasionally was very tough to be so young and far away with no phone, no skype, no internet, no e-mail i.e. none of the modern methods of communication that we now take for granted. Despite the occasional hardships I had got caught by Thailand and later chose to study Thai language and southeast asian history at the university. The academic approach to the language and history boosted my interest of the region even further and when I later started to work in Bangkok, Thailand developed into my second home country. I haven’t calculated how much time I have spent in Thailand in total but the amount of years have definately been enough to completely delete my initial ”wow feeling”. To me Thailand is nowadays just as exotic as a visit to a grocery store in Göteborg a rainy Tuesday afternoon…. Unfortunately I haven’t spent very much time in Thailand’s neighbouring countries and eventhough I know that there are great similarities between the culture in Thailand and its neighbours, I was very curious if it would be a quick or gradual transition from chinese to thai-like culture. A few weeks ago we started to discuss when we will start to see the first signs of approaching a more southeast asian landscapes and culture. 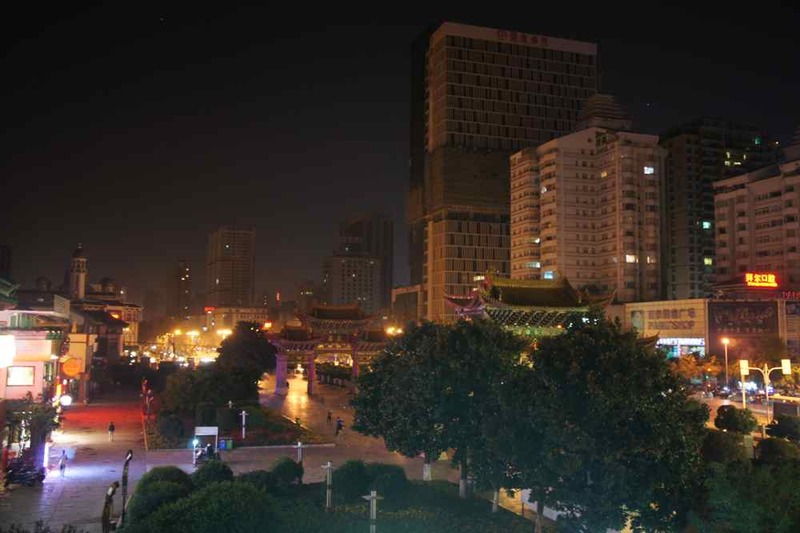 Kunming is only 250 km north of the tropic of cancer and we thought that city might be the gateway to southeast asia. The city offered us 10 degrees and rain and it felt more like being back in Göteborg rather than close to the tropics. Southern China is home to a diversity of minorities and some of them speak languages that belong to the same family of languages as Thai. 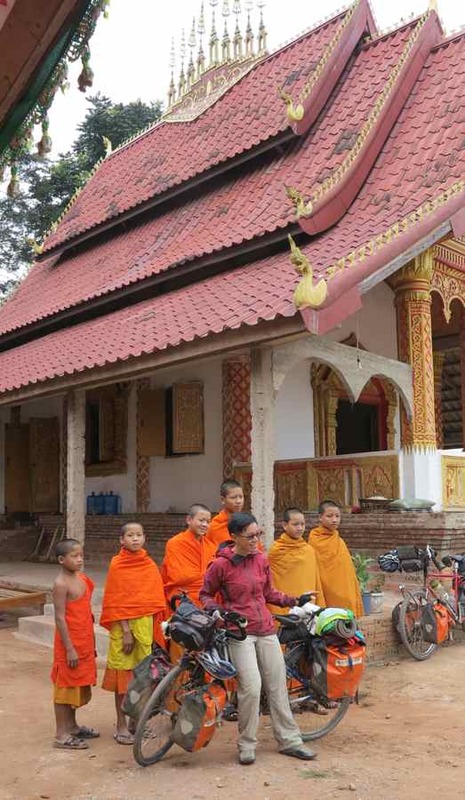 We didn’t know what to expect but we were curious to enter the area where these minorities live to see if we could see any traces of ”thai-ness”. 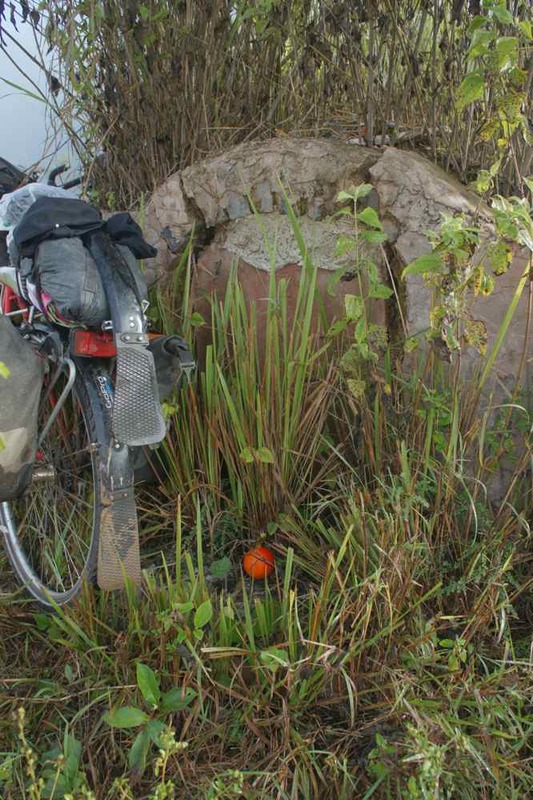 The initial 2-3 days of cycling together with Greta was in a complete chinese environment. Language, food, people and everything was just like elsewhere in China, but then the change came rapidly over just a few days. People we met didn’t always speak chinese anymore and, as I mentioned in a previous post, we could even get by by speaking Thai to people. 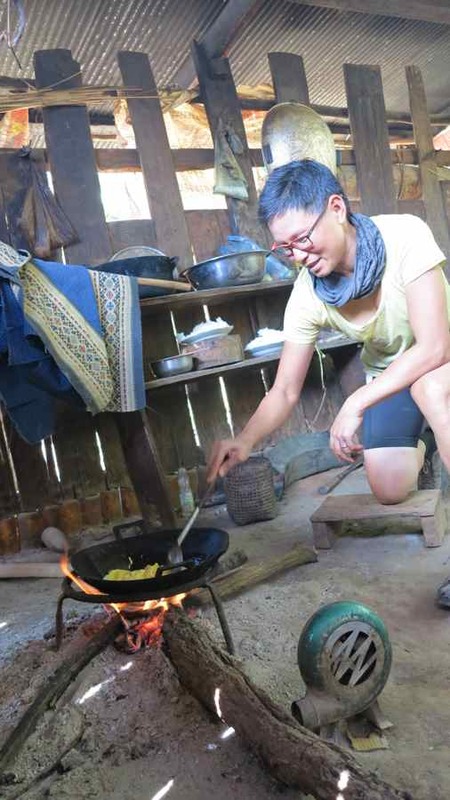 Being able to communicate freely without translation apps in the smartphone or using sign language was of course a relief and very convenient, but most of all it gave us a feeling of being close to home. Things didn’t feel as foreign to us anymore and we felt we were on our home turf. I think that if we would have cycled in the opposite direction we would have got the same kind of feeling when arriving in southern Denmark or anywhere else where Swedish could be used for communication. 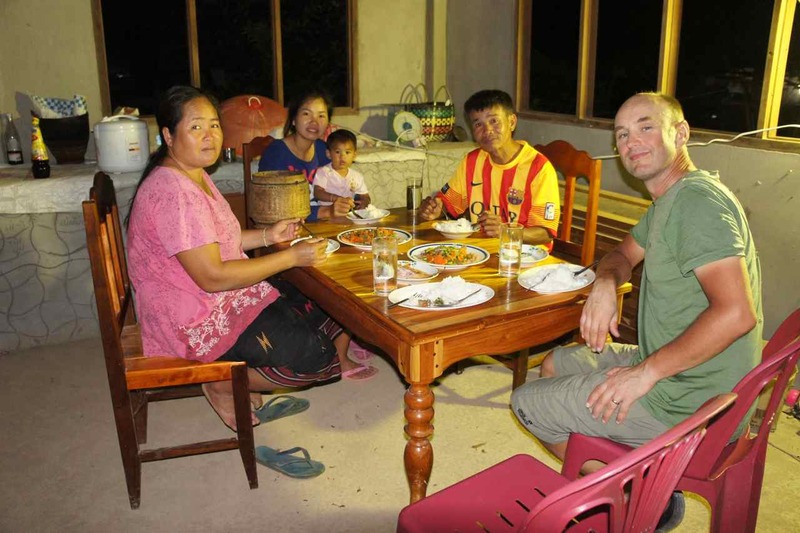 The further we got towards the Laotian border, the more people we met who we could communicate easily with. This was very convenient but it wasn’t only the common language that made us feel we had arrived to the proximity of Thailand. The last two weeks of rain and cold weather was gone and the temperatures rose and the sunshine came back. 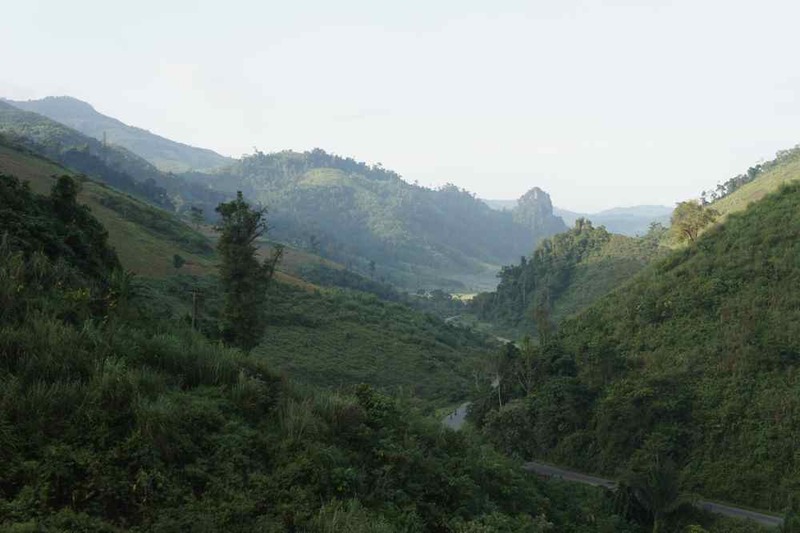 The landscape also changed and turned into something that we think resembled that of northern Thailand. The cycling was a rollercoaster up and down on steep but not very high hills. 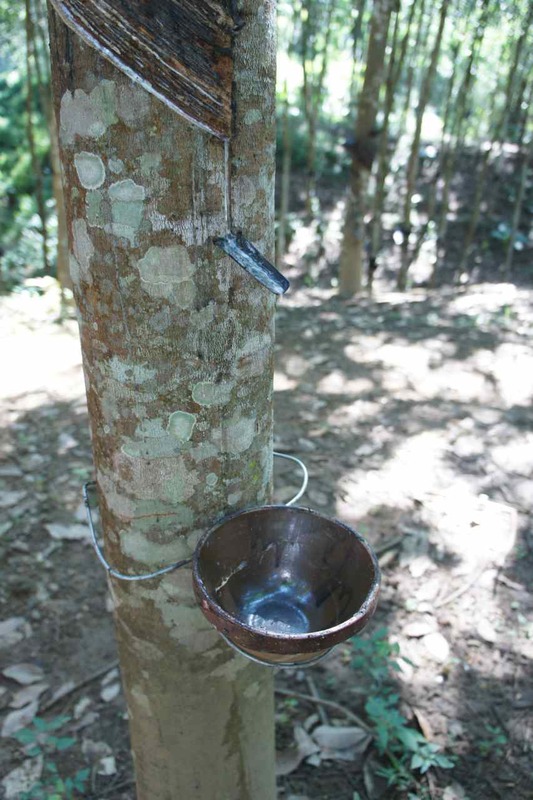 None of us know the names of thai trees and bushes, but we know what they look like and we saw many kinds of trees that we are used to see in Thailand. Another thing that made us feel close to home was the architecture. Houses in villages we passed through had so many similarities to those in rural Thailand that we almost thought we were already there. 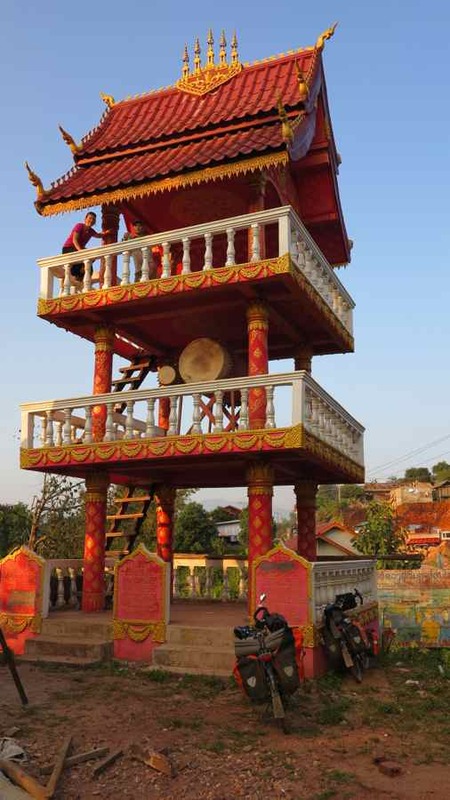 When looking closely at some houses we could see that details such as ornaments were similar, but when looking a village from a distance it also looked like thai villages with a tight cluster of many small houses and a oranged tiled temple roof as a contrast. Cycling up and down steep hills make us hungry and thirsty and every time we stopped at small shops to buy some snacks we found more and more products that were imported from Thailand. As long as we were in China most products were chinese, but there were some thai products too. Once in Laos it seemed that 80% av the products on sale were from Thailand and we felt like we had already arrived to Thailand. 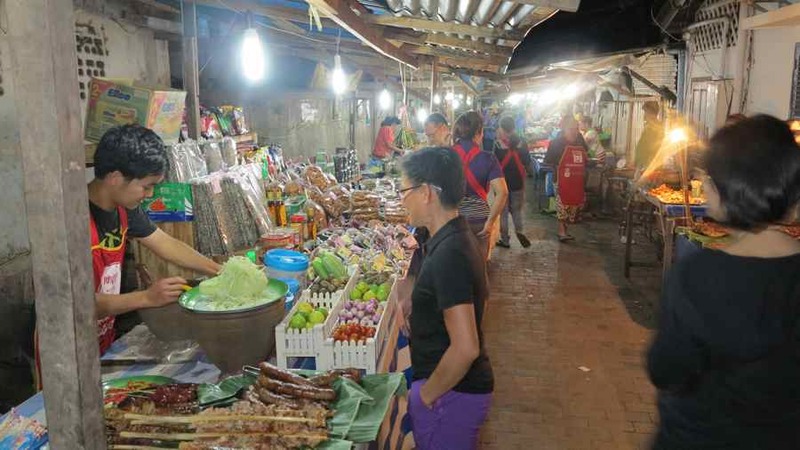 It seems like Laos import most of its consumer goods from Thailand, which isn’t very strange since they have a very similar culture and language. Just like in Thailand shops along the road in Laos always have a TV turned on in some corner and it seems that most people prefer to look at Thai TV channels. One evening we had our dinner at a small restaurant and at 6 PM we heard the familiar tune of the Thai national anthem. We have heard that song thousands of times and it is nothing we normally pay any attention to and we didn’t this time either. I think half of the song was played until we simultanously looked at each other realising that it really was the thai national anthem, that we were in Laos and not Thailand and that we had biked all the way from Sweden to that little restaurant. It was like a wake up call that we are getting closer now…. No, we aren’t in Thailand yet. This photo shows the corner of a street in the chinese town Mengla, but it looks like it could be in any thai town. Everytime we saw something that resembled something thai we got surprised and happy. We pointed out thai looking things to each other and sometimes stopped to take photos. I find it interesting that ordinary things in Thailand that I find as exotic as going to the grocery store in Göteborg, can be so very interesting and exotic outside Thailand. After all a thai style ornament on a roof is not such exotic after all but I think that after cycling thousands of kilometers through snowstorms, burning desserts, across tall mouintain ranges and meeting new cultures, seing a thai style roof or hear someone speak a language close to Thai makes us feel that we are soon there even if we haven’t yet crossed the border into Thailand. My second cousin Greta is a person who is a true outdoor adventurer. The last years she has done expeditions on skiis in arctic environments and she is a very tough woman. Going on a multiday cycling tour in a hilly landscape was new to her and before she left Sweden she bought herself a brand new leather saddle that takes about 500-1000 km to break in. When planning our ride together we knew Greta is a person who don’t give up because of some rain or aching muscles. She is absolutely fit for a tough ride in the mountains, but all of us, Greta included, suspected that even if her muscles are strong enough for this kind of endeavours, her experience from skiing in the arctic maybe hasn’t prepared her bottom for sitting long days on a brand new very hard leather saddle….. The plan was therefore to cycle not too long daily distances – it was after all her vacation and we wanted to enjoy each other’s company without pushing hard and rushing through this nice and interesting area. 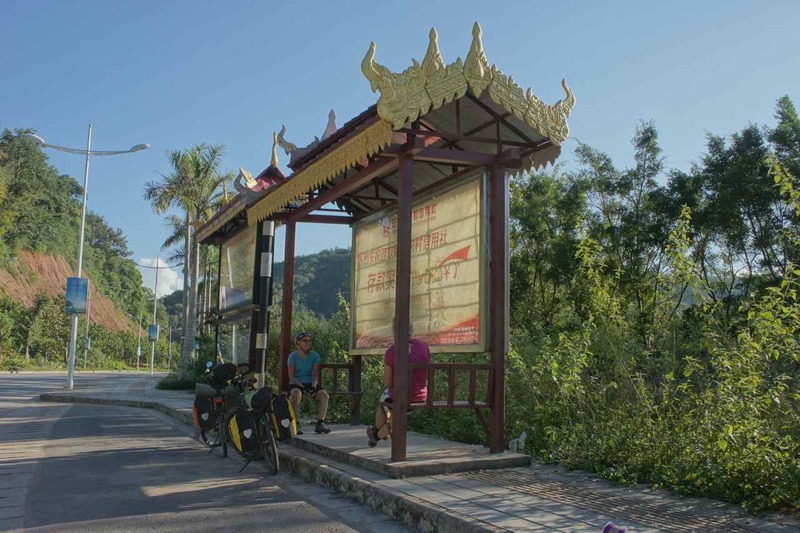 Since the distance from Kunming to Luang Prabang is too long to be possible to cover within the two weeks Greta has been with us, we decided to start cycling from the city of Mojiang some 250 km south of Kunming. Wej and I planned to cycle there ahead of Greta and take a bus back to Kunming and pick her up at the airport. 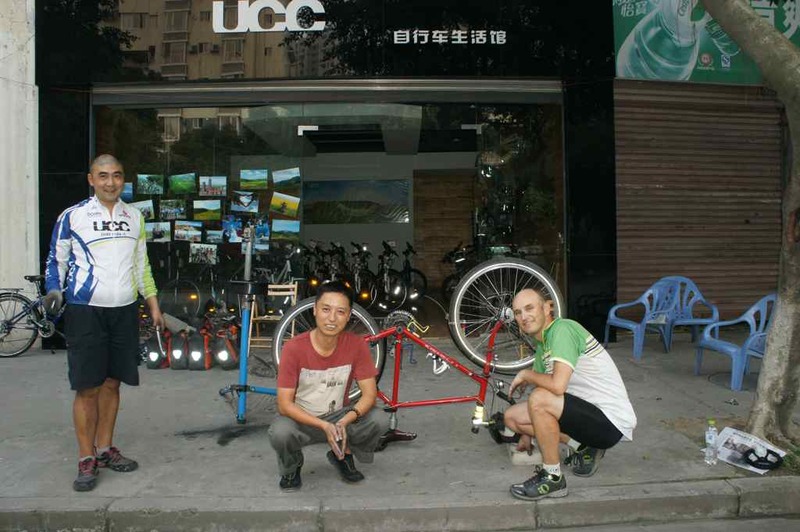 When we left Kunming I got some mechanical problems and had to return to get my bike serviced. This meant that there was no time for us to cycle there anymore and we decided to wait for Greta in Kunming and take the bus to Mojiang together. 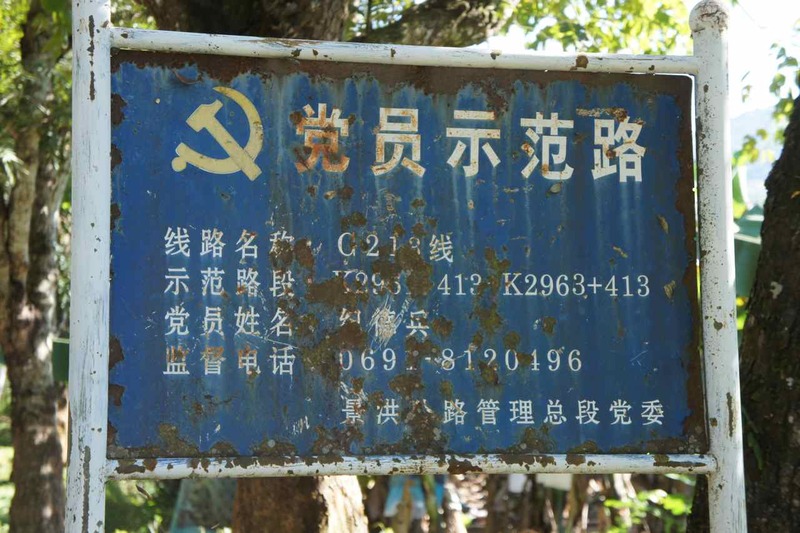 Some road signs were in only Thai on the chinese border to Laos… !!! 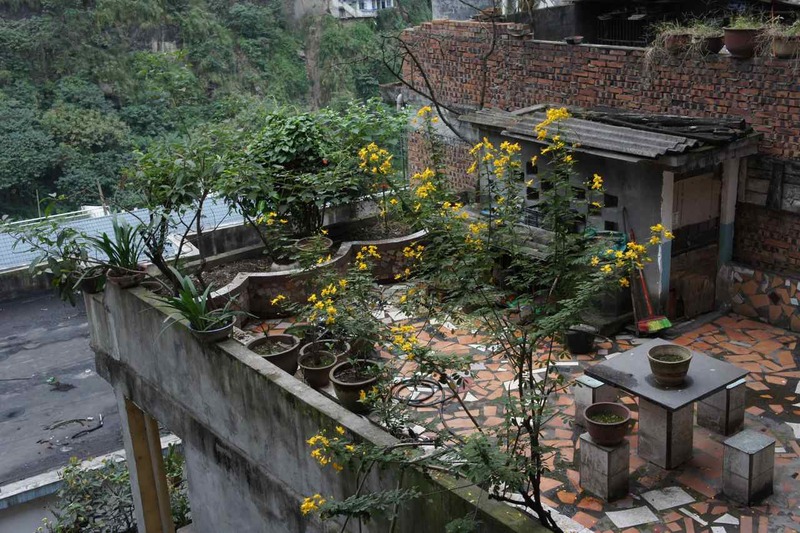 We arrived late to Mojiang and when we looked out from the window the following morning the rain was pouring down. It wasn’t cold like in Kunming, but getting wet is never fun. Wej and I use ponchos for rain protection, but we have no rain pants. This is no problem since the upper parts of the legs stay dry under the poncho and the mudguards take most of the water that gets sprayed from the front tyre. This is only valid IF there is a mudguard….. When I changed tyre a week ago I had to remove my mudguard and since then my legs get soaking wet in 5 minutes after it starts to rain. Solving problems is a part of this trip and what to do to stay decently dry? It is simple – get some plastic bags and tape them around the legs and voila – you have created a new rain pant. It doesn’t look good and it’s certainly not high-tech, but it works. Making plastic bag-tex rain paints…. Our first day on the bike with Greta was a 60 km gradually downhill experience. We didn’t have to use much effort as we rolled between the mountains on a small countryside road. The rain stopped after some time but it was still very humid and the road was wet. We didn’t want to camp and found a very nice newly built simple hotel in a town that has a name that is so long and difficult to spell that I won’t even try to remember it. Day two was going to be the climbing day. The first 45 km was going to be rather flat and then a climb of about 1000 vertical meters was waiting for us. 45 km is a good distance to warm up for such a climb, but there was a but……. After 20 km the condition of the road changed abruptly. It had been a nice sealed road but at a certain point the asphalt ended and the road turned into a dirt road. All the raining the last week had turned this dirt road into a ditch of soft mud and we had to zig-zag in order to avoid the largest potholes. Sometimes the mud was so deep that the surface of the mud reached well over our hubs. The speed wasn’t higt and even if we tried to avoid it we sometimes had to put our feet down in the slushy mud water. We rode through this for almost 20 km and when we got out we were severely delayed and wouldn’t have time to climb that mountain. There was a house right after the muddy section ended and we asked the man who lived there if we could get some water to clean ourselves and the bikes. He then pulled out a water hose and we spent half an hour to get our bikes and ourselves decently clean again. After our session in the mud we started to talk about finding somewhere to stay. There is not much flat ground in this area and where ever there is flat land, there is always a house. At the bend of the road we found a large flat area that was used as a deposit for gravel. No work was going on and we were alone there so we decided to pitch our tent on top of the piles of gravel. Gravel is dusty and we and our equipment turned grey after staying at Camp Gravel Hill…. We took on the big climb the following morning and it went very well. It was the first 1000 meter climb for Greta and she did just great. 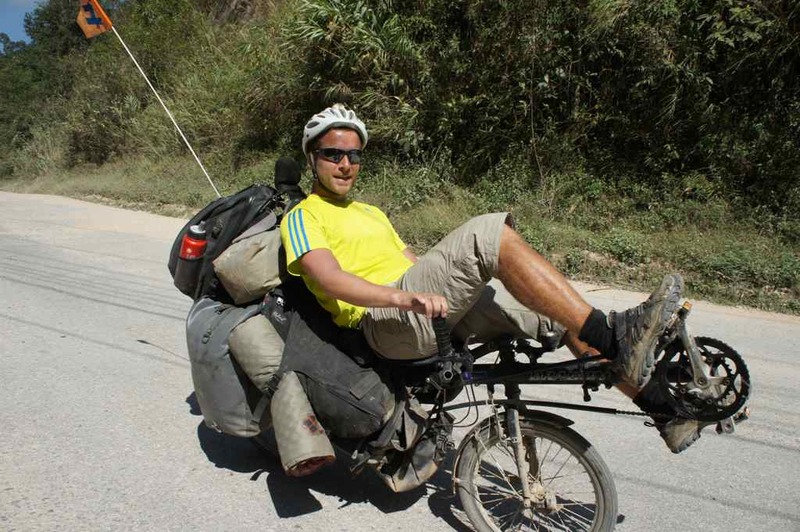 Not so far from the top we caught up with a french cyclist who rides a recumbent and we rode together to the next city where checked into a small hotel that had signs in thai and laotian, but no staff that could speak any of those languages. We parted with the frenchman the next morning since he had to take a bus out of the country due to his visa was about to expire. Our plan for this day was to cycle for 100 km but after 85 km we saw a path that led from the road to a little hill. 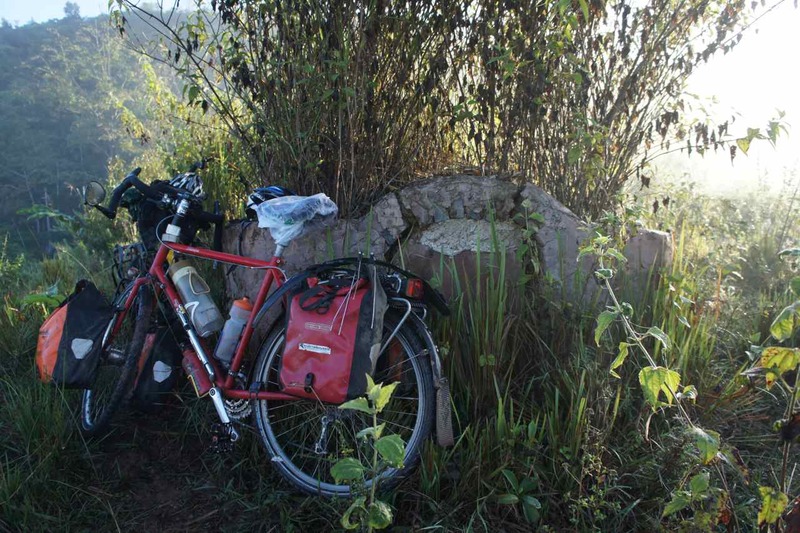 We thought it could be a good place to camp and pushed our bike through out on the hill and parked the bikes beside a low concrete wall. Not until after the tents were up did I realize that this was actually a grave and there was another one 15 meters further on too. We had some fruit with us and when we left in the morning Wej did just like what she usually does when visiting a chinese grave – she put a fruit in front of it and gave it a ”wai”. Leaving a fruit in front of the grave as a thank you to the one who stays inside. 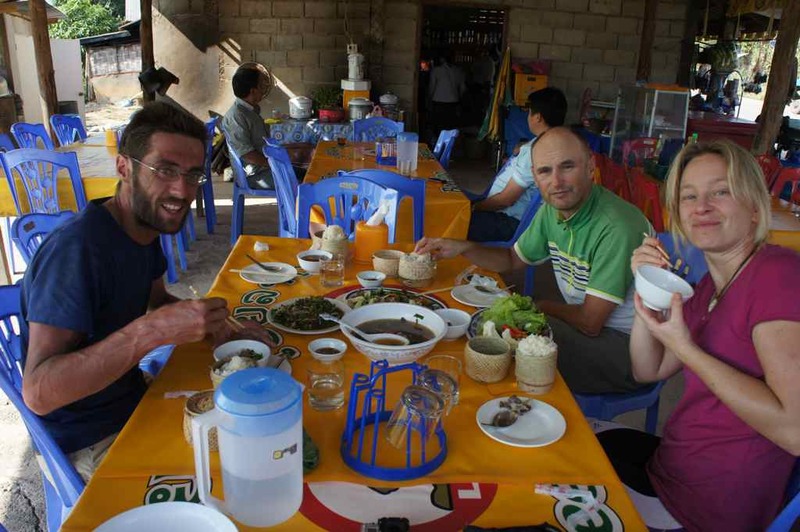 Next day we arrived in Mengla which is the last proper city before the border to Laos. Our plan was to ride past it but it looked so nice so we decided to stay and spend the evening just walking around and absorp the atmosphere. It all resembled a Thai city very much and Wej and I couldn’t stop pointing out similarities to Thailand. It is only 50 km from Mengla to the border and we arrived to the checkpoint by noon. After having lunch and changing money we left China after 77 very interesting days. 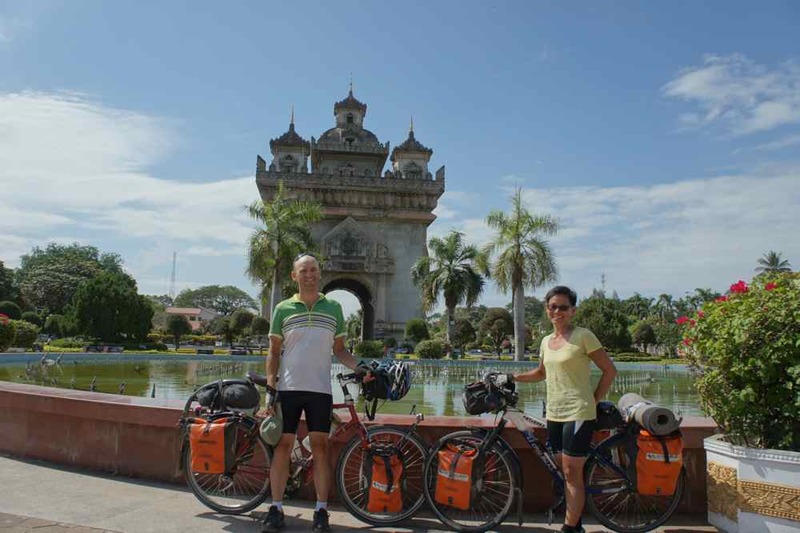 We only cycled some 50 km on the Laos side the first day and stayed the night at a small guesthouse. 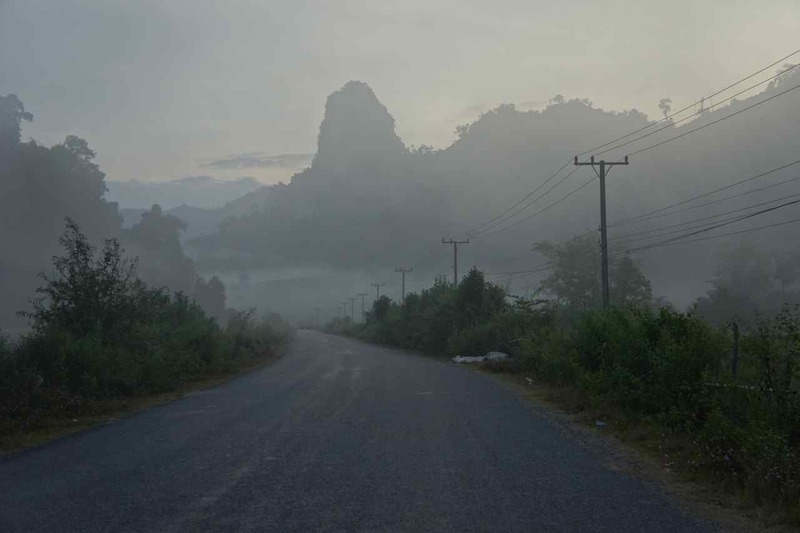 The roads in Laos had so far been good, but immediately after leaving Camp Drum Tower we got on a road that was in bad condition. 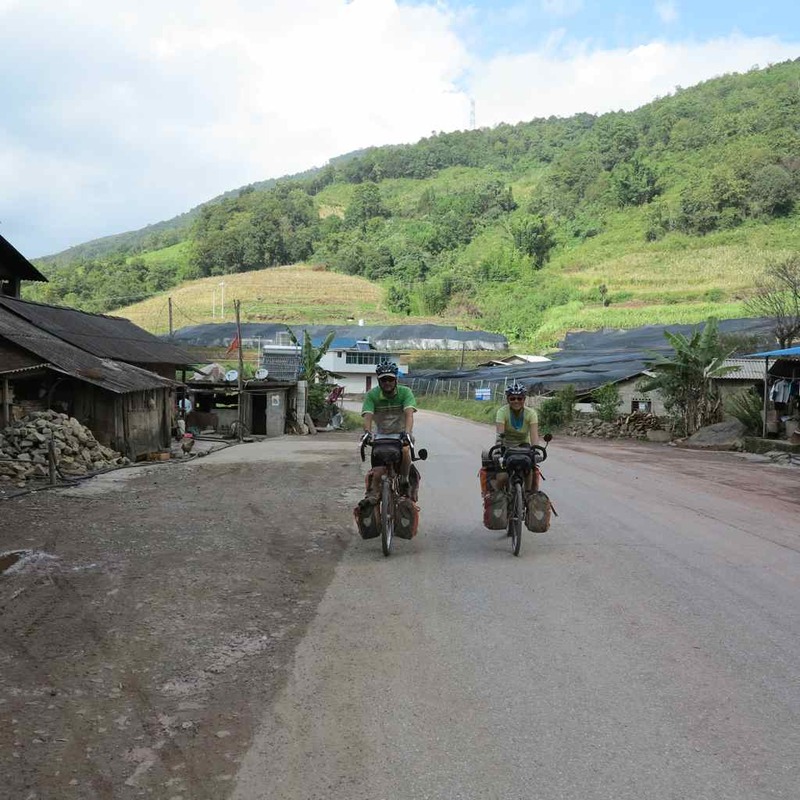 First we had to do a major climb and then we had to speed down zig-zagging between the potholes and the loose gravel and we just barely made it to the small town of Pak Mong before it got dark. 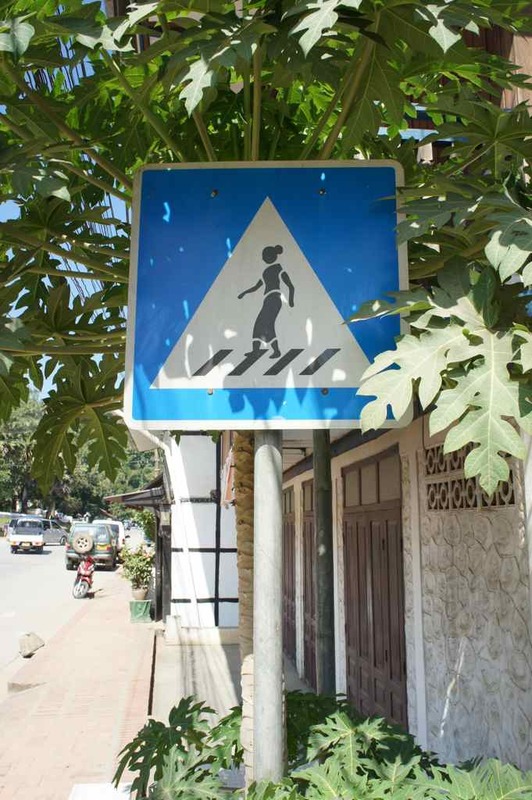 In most countries it would be a man on this sign. 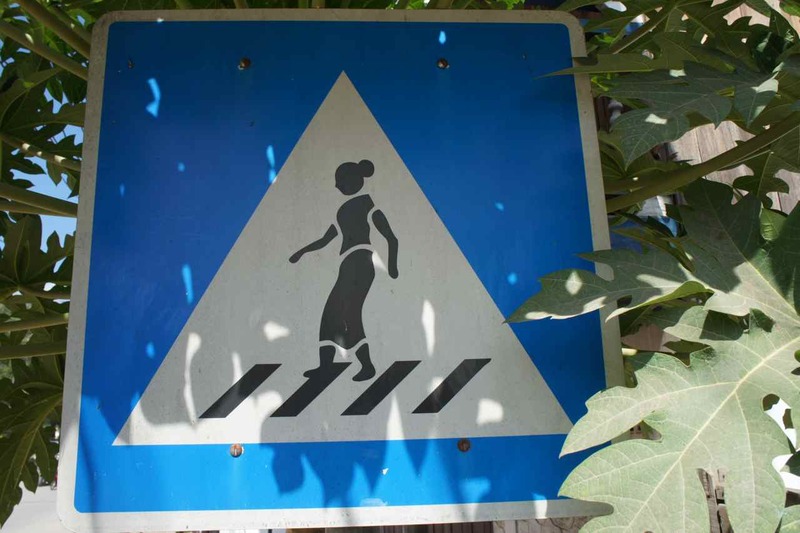 in Laos it is a woman. Interesting! Thailand is usually called the land of smiles. 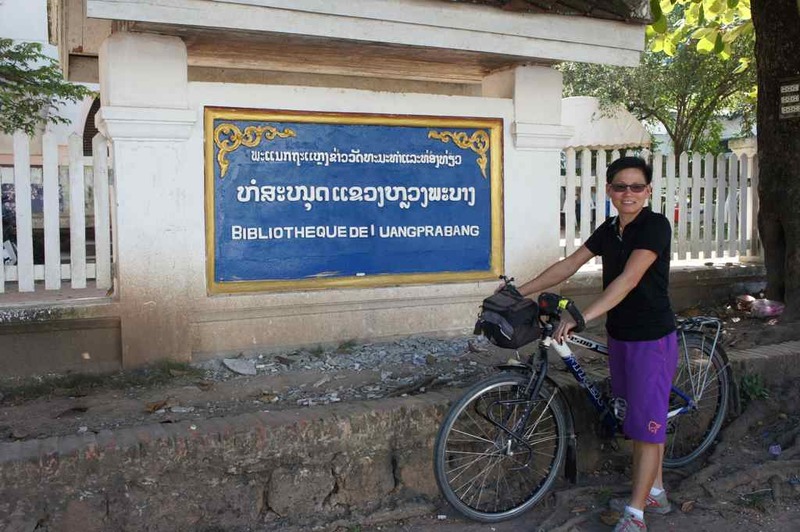 Cycling in Laos proved that Laos is the land of the even bigger smiles. We liked China and the chinese people, but they were a bit reserved. It only took us one hour of cycling in Laos to realise that the laotians seem to be much more outgoing towards bypassing strangers. There is always a big smile and everywhere the children shout ”sabaidee” (hello) and wave at us. 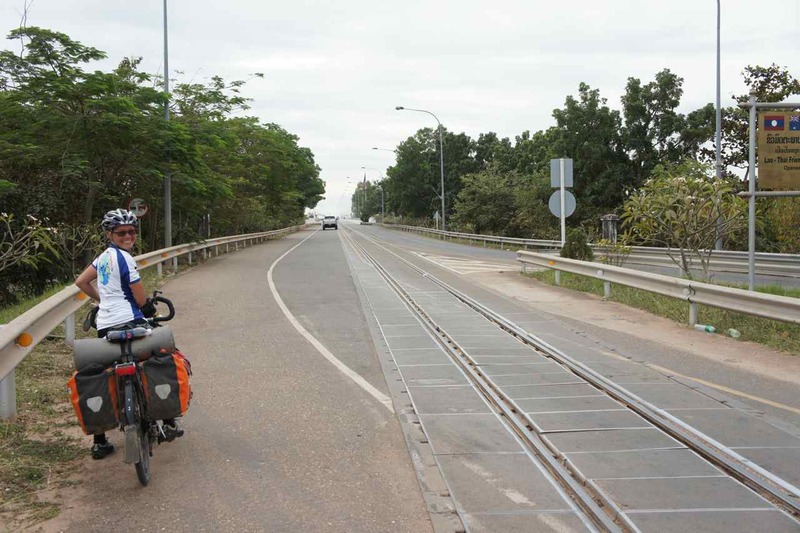 It will be very interesting to see if it will be like this when we ride across the Thai countryside. 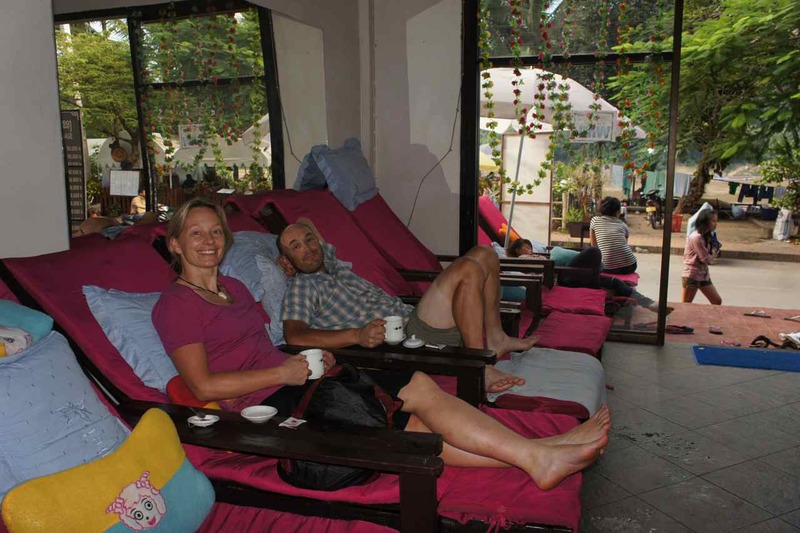 Waiting for a foot massage in Luang Prabang. The quick changes between the cosy life in nice guesthouses and rough camping is one of the joys of this journey.Look at my two colored legs – I am working hard to get a cyclist tan. 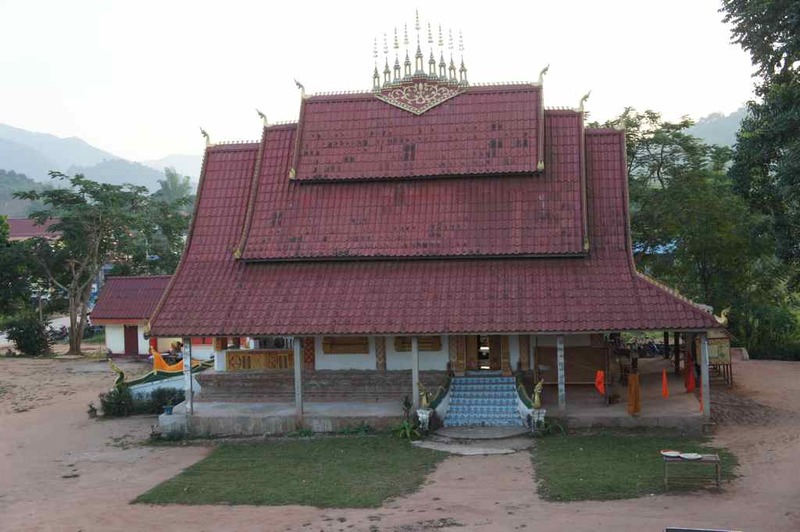 Arriving into Luang Prabang was like arriving into a giant tourist attraction. 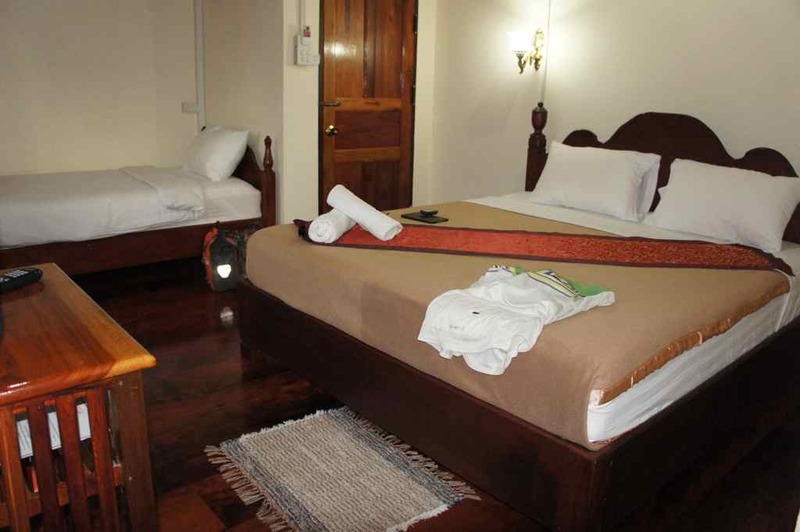 Hotels and guesthouses everywhere and cosy restaurants serving nice food line the streets. There are plenty of foreign tourists here and we have spent a two days relaxing, eating and getting a very needed massage for our aching muscles. 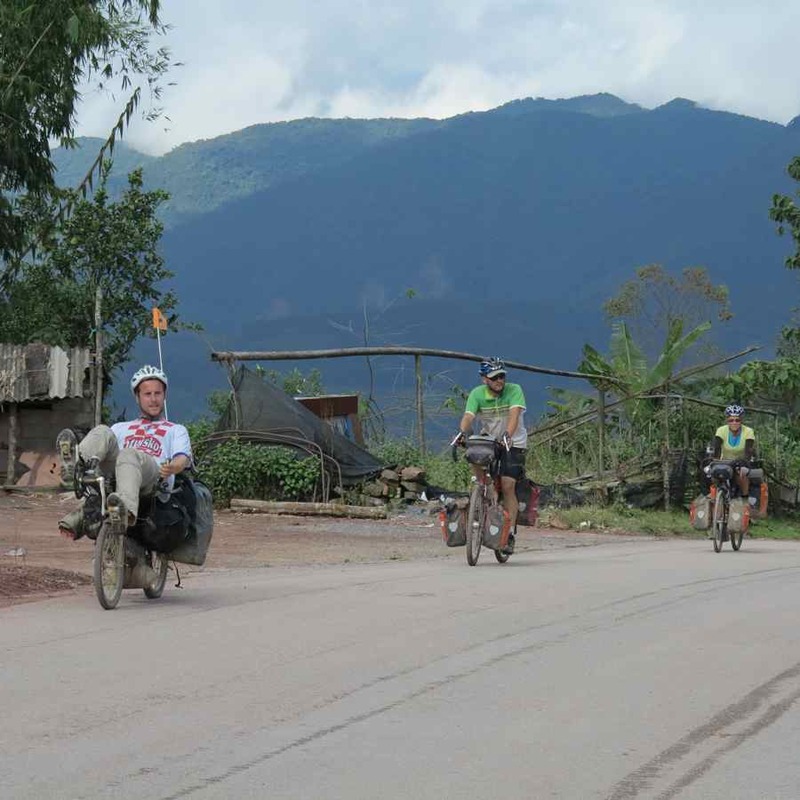 Tomorrow we will start the four day ride to Laos capital Vientienne. I will apply for visa to Thailand there and while we wait there we will sit on the shores of the Mekhong river, drinking a Beer Lao and watching Thailand on the other side. P.S. Some of the photos in this post is taken by Greta. Greta flying over our guesthouse on her way home. Have a safe trip – it was a pleasure to cycle with you. This entry was posted in Posts in English on November 9, 2013 by admin. This entry was posted in Posts in Thai / โพสต์ภาษาไทย on November 9, 2013 by admin. 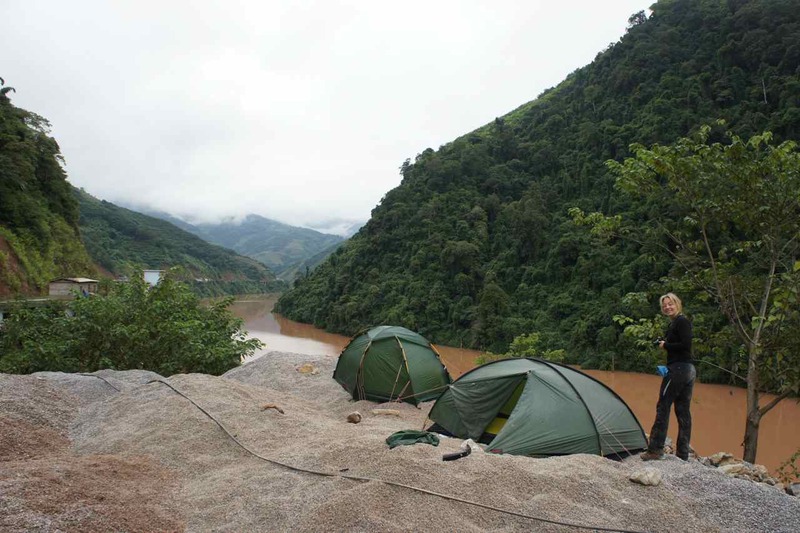 We have camped a couple of nights during the last few days and I have prepared a longer text about our ride from Kunming towards the Laos border. 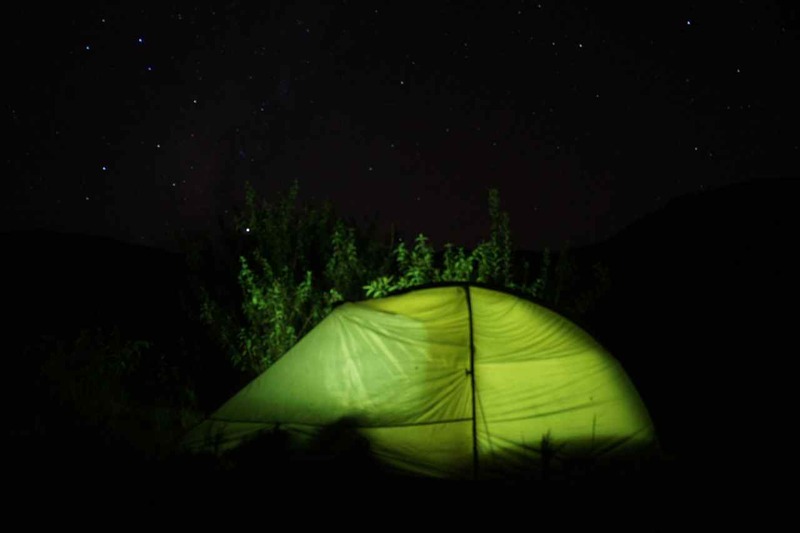 It takes longer time to write while sitting in a tent and it isn’t ready yet. When we checked in at a hotel last night and found out that there is internet in the room I decided to make a short update to tell that we are alright. We have cycled together with Greta for five days now and we have traveled on a minor provincial road that is very beautiful. The road passes small villages and occasionally some minor towns. The landscape is very hilly to say the least and the last three days have been a roller coaster. We have slowly climbed up the steep hills and speeded down the serpentines. 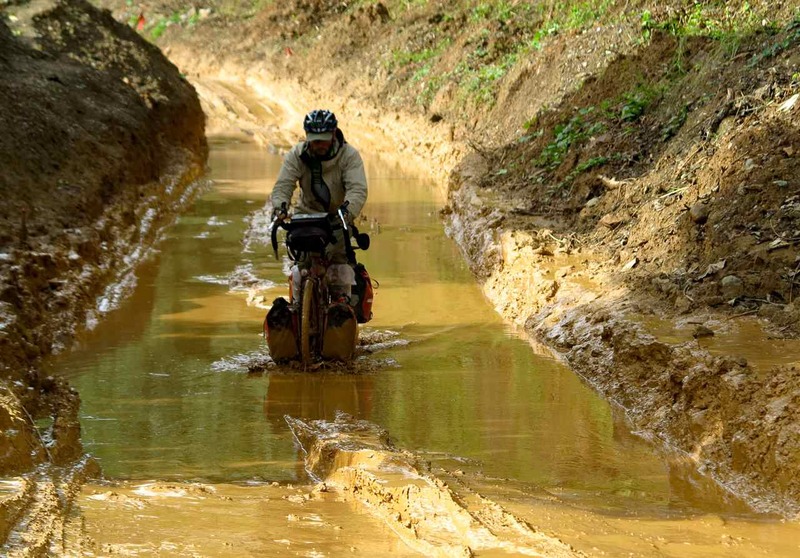 The road has been in good condition apart from an almost 20 km long and very muddy section where the slushy mud sometimes reached up to the hubs of our wheels. 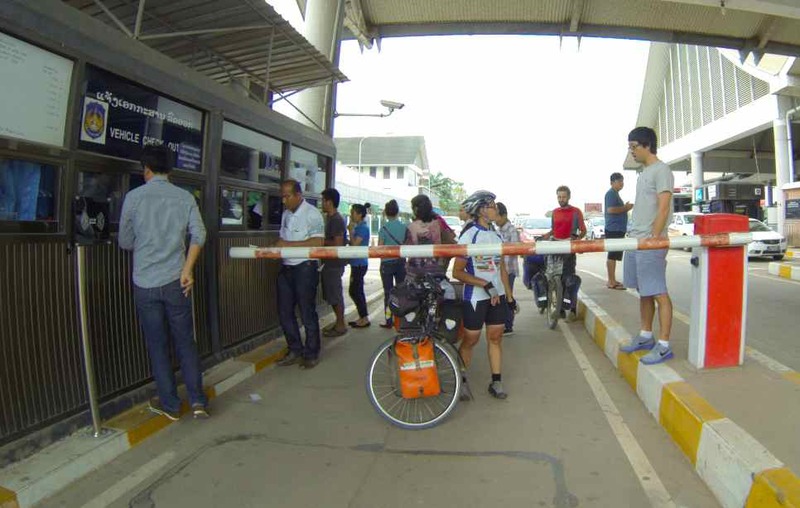 The distance to the border to Laos is now 100 km and our plan for today is to stay ride as far as we can but not cross over into Laos until tomorrow morning. 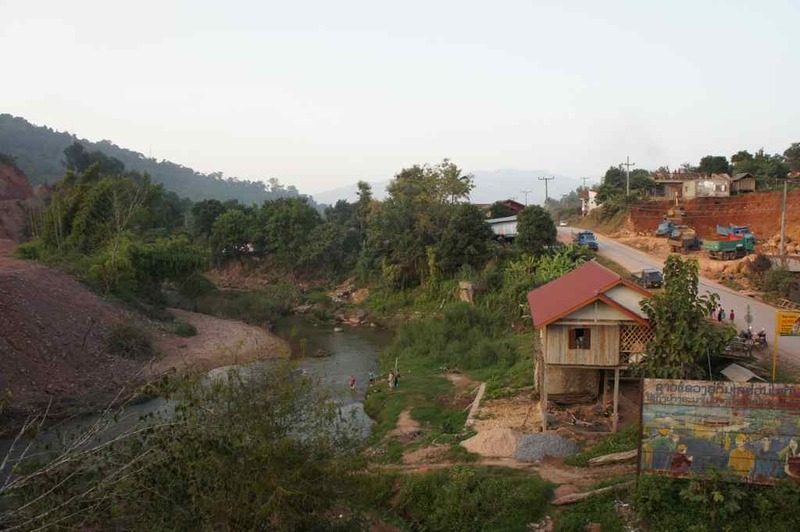 Once inside Laos we won’t have any internet connection until we reach Luang Prabang either on Wednesday or Thursday afternoon. This means that the next blog update will be published late next week. Please enjoy the photos below as a teaser for the proper update of the blog that will come next weekend. This entry was posted in Posts in English on November 2, 2013 by admin. The few weeks before we set out on this journey we were busy preparing everything and saying good bye to all our friends. The winter was unusually cold and one night I rode my bike along the icy cold streets of Göteborg to the yacht harbour to visit my friend and second cousin Greta at her sailing yacht. We had a nice evening and shared a bottle of wine. Greta interviewed me in detail about our coming trip and being an person who really likes outdoor adventures she asked if it was OK if she joined us somewhere along the route. will catch a flight back home to Göteborg. 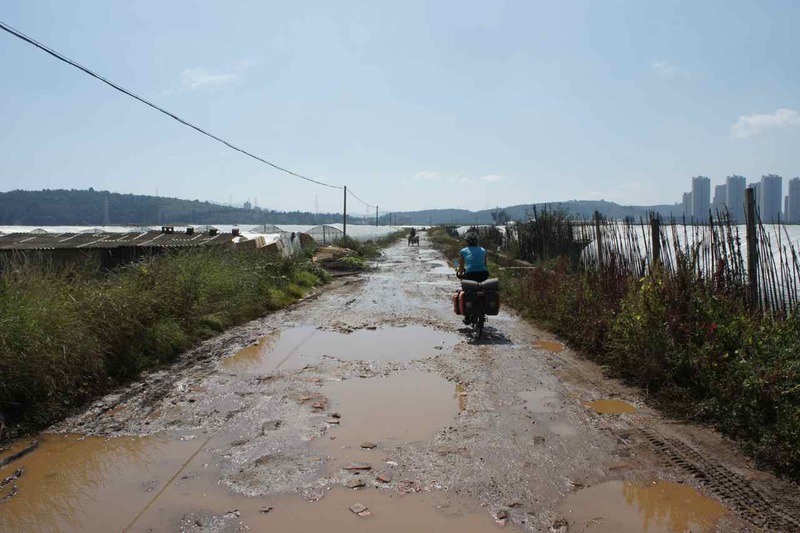 When Wej and I arrived to Kunming five days ago it was raining and less than ten degrees. We stayed in a shared apartment with a German cyclist we had met along the way. 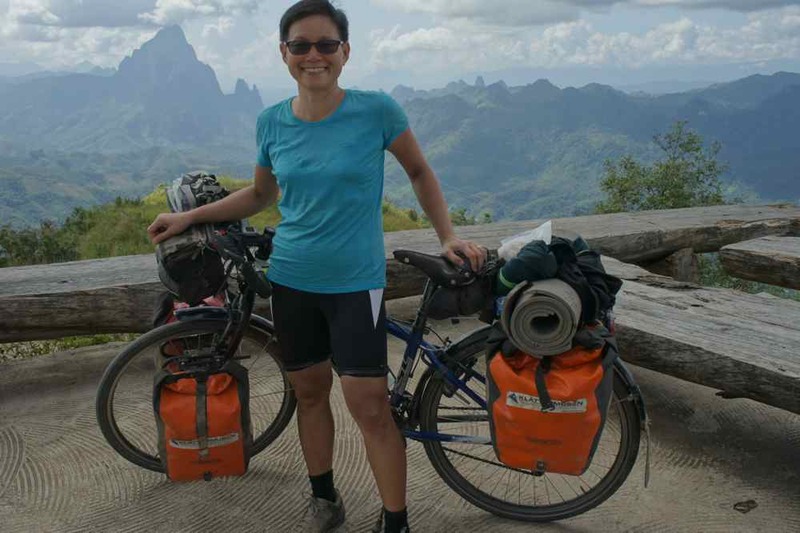 Since the distance from Kunming to Luang Prabang is too long to be able to cover during the time Greta is here, we will have to start cycling from Mojiang some 250 km south of Kunming. The elevation profile from Kunming to Mojiang is flat or downhill with only a few not so big climbs. Wej and I thought we could cycle there in two days and I would than catch a bus back to Kunming to meet Greta and then take her to Mojiang. 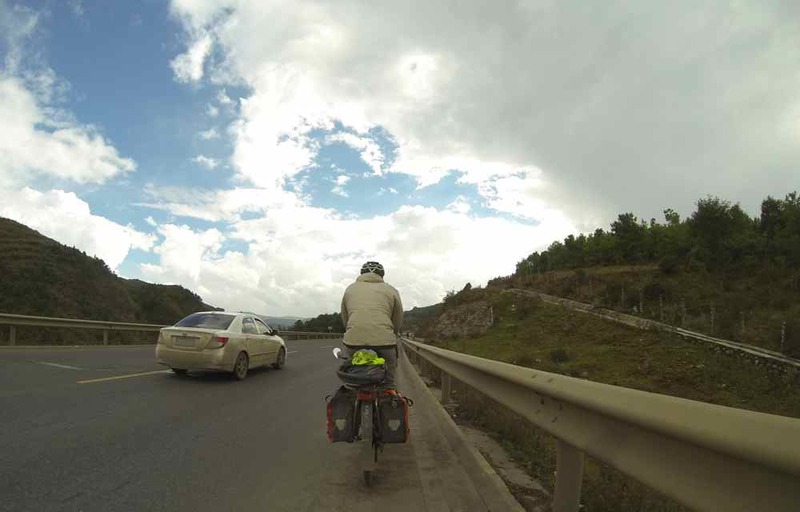 Before we started to cycle to Mojiang we got a message from another cyclist riding a few days ahead of us that the small road beside the highway south of Kunming was in a bad condition. Since the weather was good we coldn’t wait to get moving again but as soon as we got out of the urban area we ended up on a muddy road full of water filled potholes. 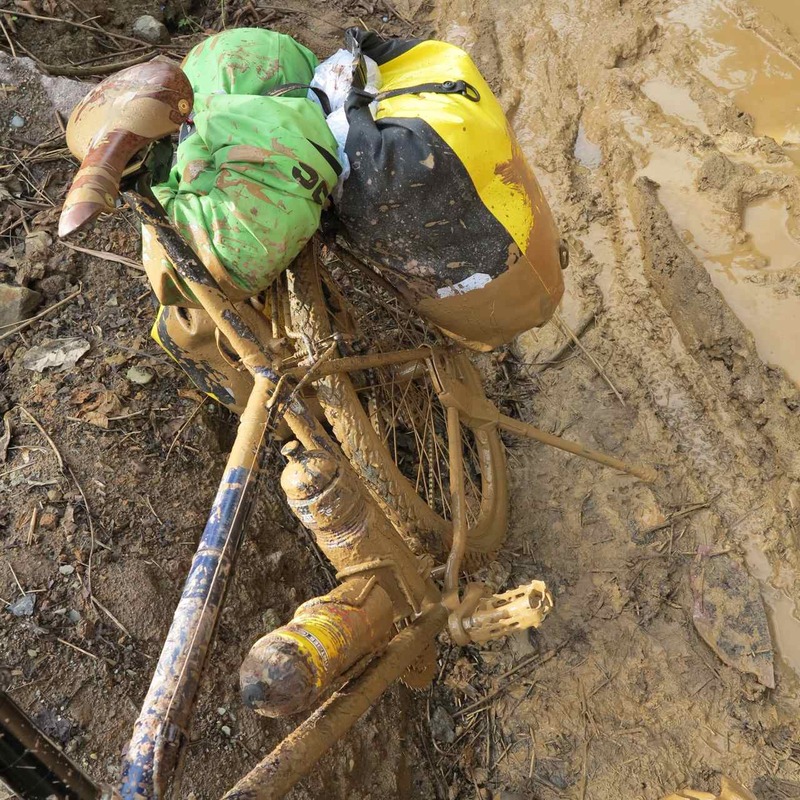 Both our bikes and ourselves got completely covered in mud and after a while I could feel a scratching feeling from my bottom bracket. The feeling wouldn’t get away even after I rinsed the chain and the chanrings. 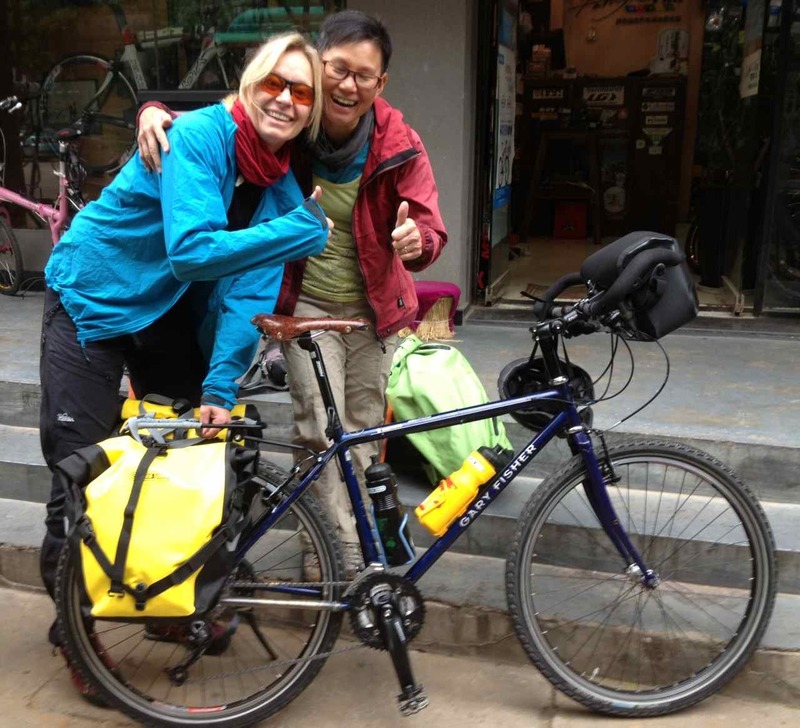 Not knowing what the problem was we decided to return to Kunming, get my bike fixed and wait for Greta’s arrival. 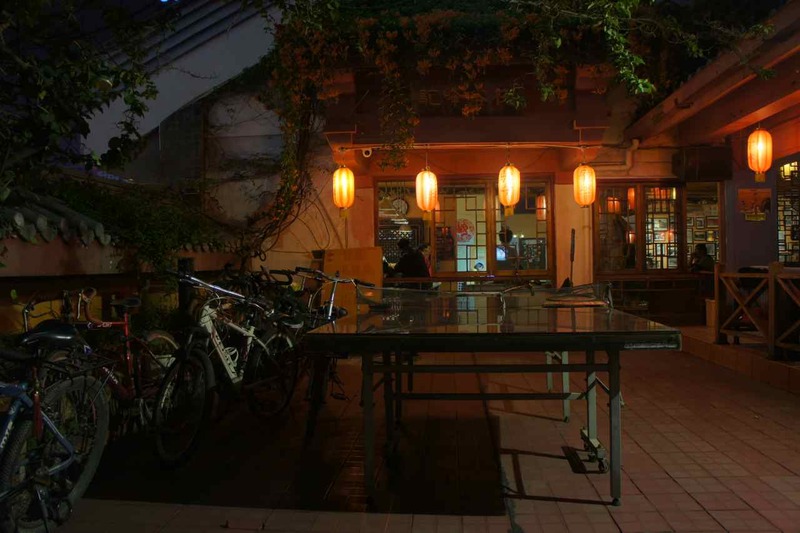 The mechanic at one of Kunming’s best bicycle shops told me that my bottom bracket was OK but that my middle chain ring was completely worn out and my bearings and cone in my rear hub needed to be changed. The components on my bicycle seem to have unusual sizes and the bicycle shop we visited had no bottom bracket and chain ring of the right size. Greta was going to make a short stopover in Bangkok to borrow a bike from our friend Mah who also happens to be the owner of BokBokBike which is Bangkok’s best touring bike shop. Since the shop in Kunming didn’t have the parts we sent a mail to Mah to include two new tyres, two bottom brackets, new chainrings and some other minor parts in the box with Greta’s bike. 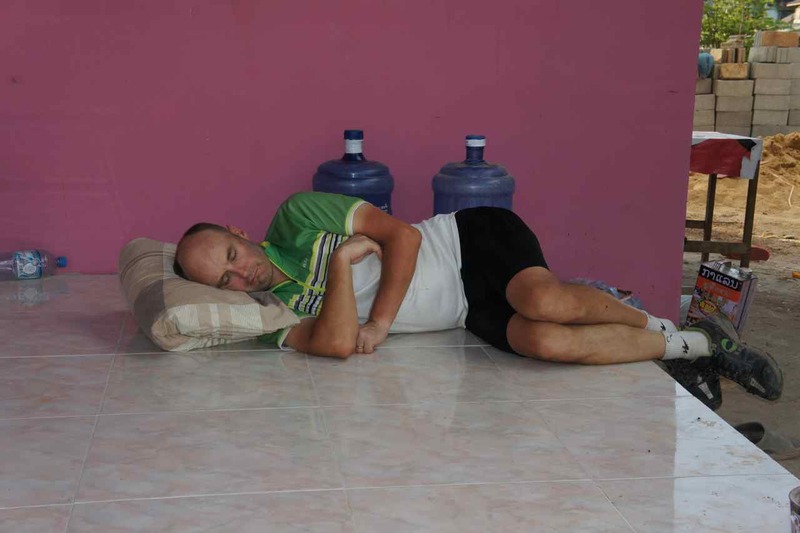 This long journey has taken its toll on our bikes but now we hope they are ready for the remaining +2000 km to Bangkok. 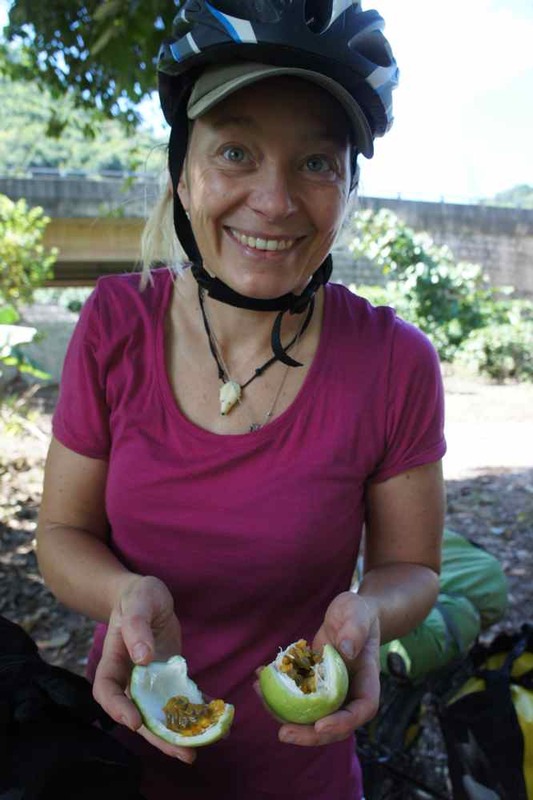 We are so happy to have Greta here and we will try to do our best to introduce her to bicycle touring. 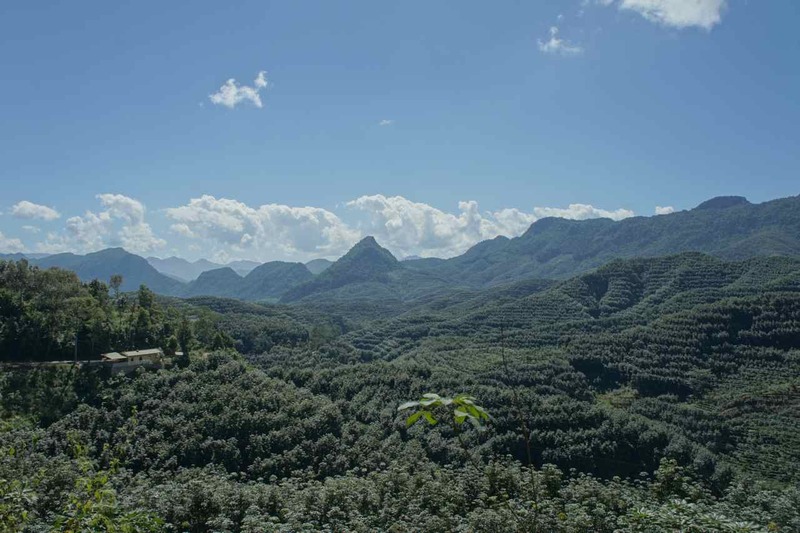 We just hope the weather in Yunnan and Laos will cooperate….. This entry was posted in Posts in English on October 27, 2013 by admin. Before we set out on this journey I had the ambition to update my part of our common blog continously. The access to internet was very good in central Europe and I could make daily updates, but as internet connections became more and more scarce the blog got updated less and less frequently. It wasn’t because there was nothing to tell, only that it was so complicated tell the story. A few weeks ago here in China I got a writer’s block and didn’t update my part of our blog for almost two weeks. Now it has been almost two weeks since the last update and this time it isn’t because of any block. Firstly, we stayed in Chengdu for almost a week doing nothing and it is hard to tell an interesting story about what we do and our experiences when we do nothing…. 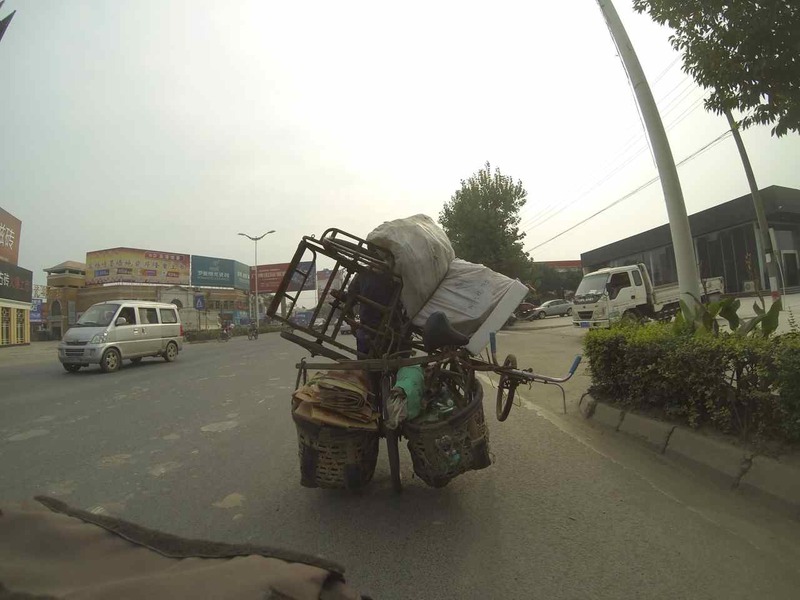 When we then started to cycle the first few days out of Chengdu it was rather uninteresting from a cycling or traveling perspective and there was really nothing to tell. Secondly and more interestingly is that we are now quickly approaching the end of this journey. Fro/m the start in Sweden in February until 2-3 weeks ago we have been living in a time bubble consisting of here and now and we rarely thought further into the future than a few days at the time. Of course we have had rough plans to stick to – the visa clock has been ticking since we left Georgia, but that has been pretty much the only time constraint we have had. We have not been aware of what day in the week is and not what date it has been either. It has been a very pleasant experience to live like this and I recommend you all to try it sometime. It is today only 39 days left until we on November 30 will ride our bikes across the Chao Phraya river into downtown Bangkok. Of course we could make a discrete arrival to Bangkok, take a few photos at the finishing point and then continue as all other times we have flown into Bangkok for vacation. This would be possible but it isn’t the way we want to do it. 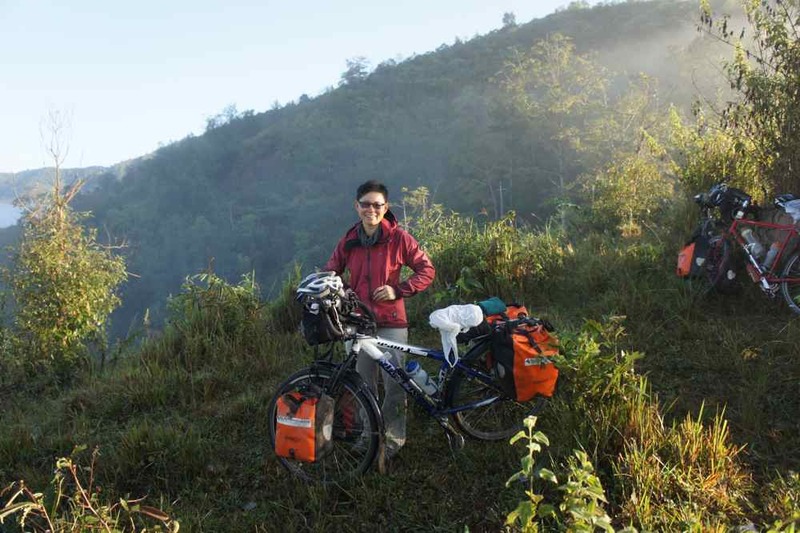 We want to cycle through Thailand with our friends and other local cyclists and we would like to host some kind of arrival party in Bangkok and all this need to be planned. The last few weeks we have been too pre-occupied with the arrival to Thailand and all the arrangements around it rather than what is here and now. This has not only taken time from writing blog updates, it has also forced us to get out of our comfy ”here and now time bubble”. Nowadays we are very well aware of what date and what day in the week it is and in a way it feels like the journey is over even when we still have more than a month to go. We hope we can be able to publish our plans for our arrival to Thailand and Bangkok on this blog within a week and then get back into the time bubble while traveling through south China and Laos. 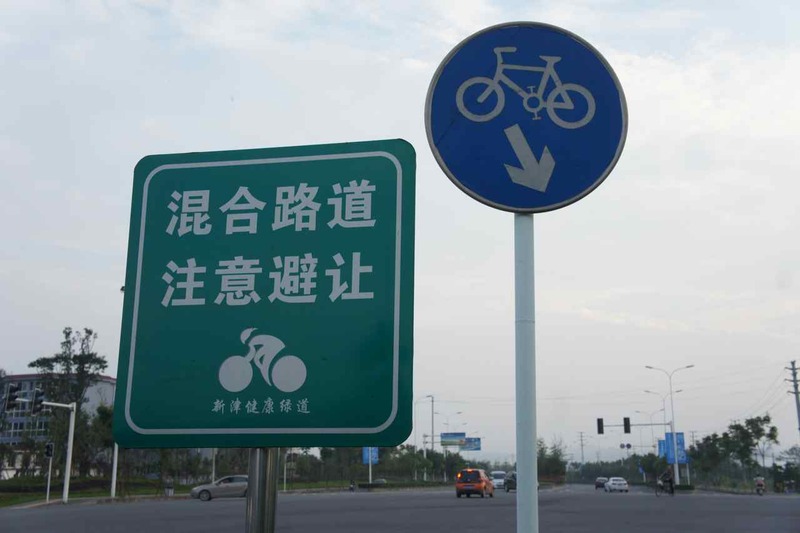 Interesting sign at the exit of Chengdu. What does it say – race bikes to the left and normal bikes to the right or what??? We have lost three dear friends…. We submitted our applications for extension of visa when the visa office opened after the one week holiday. One day later we got our passports back with a new sticker attached telling that we can stay until November 10th. It was a great relief and we went back to the hotel to pack our bags to be able to leave early the next morning. When we had cycled less than 500 meters the following morning Wej complained that her rear wheel was wobbleing. Luckily we were just outside a bikeshop and we asked the mechanic to take a look at the bearings. It turned out that the the cone we got replaced in Hami some 1500 km ago was worn out. This was far too early and has caused us a lot of concern. The shop didn’t have any replacement cones to sell so the mechanic jumped up on his bike and guided us to the city’s sport stadium where there were at least 10 bikeshops side by side. Wej got her hub serviced and I got a new bottom bracket. We got our bikes washed and another mechanic dissembled Wejs hub, cleaned the bearings and replaced her cone. It took a while and when we left we had lost our first friend that day, but we didn’t notice it until the following morning. It took a long while to repair Wejs hub and clean our bikes and when we were ready we decided to not go on cycling that day but to go back to our hotel and check in for another night. 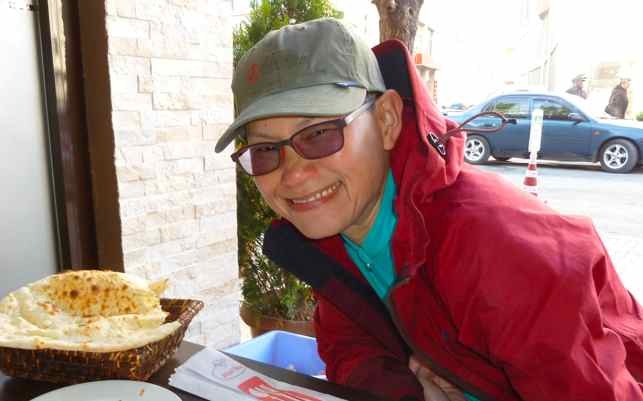 We then went out to have dinner at the simple restaurant that we had visited a few times already and when we returned to the hotel we realized we had lost friend number two. A few days later we lost the third friend right in front of the entrance to a tunnel. 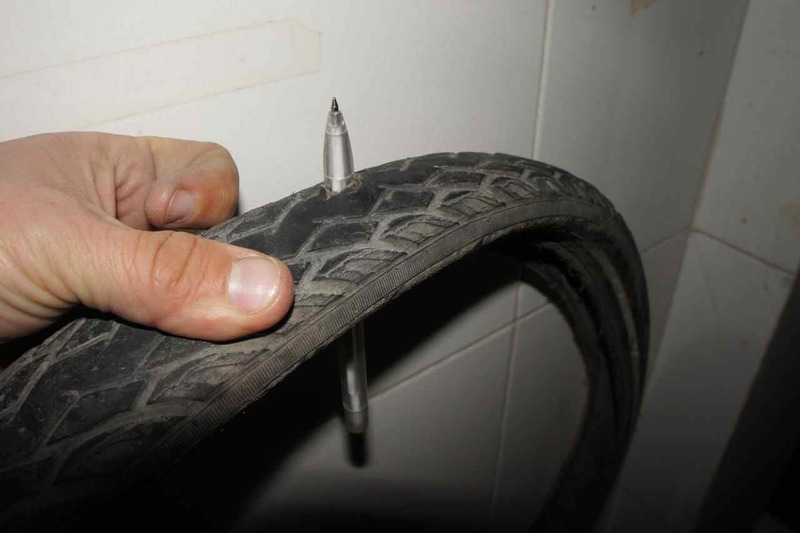 I had got a flat tyre a kilometer earlier and quickly changed to a new innertube but when I started to cycle I could hear a loud nosie for every turn of my newly fixed front wheel. I stopped to investigate what it was and realized friend number three was lost. So who are these lost friends? Lost friend number one is Wej’s dear green cap that she has had for many years and on this trip she has worn it under her helmet every day. It has served her well and protected her face and head from the strong sun during many many hours of outdoor activities not only on this journey. Its military dark green colour had faded and the cap had got a very nice patina, but now it is lost forever. Wej is sad to have lost her friend but is also happy for its long and loyal service. Lost friend number two is a souvenir soft toy from the Turkish football association that we got as a present when we fixed a flat tyre on the main square in Trabzon where the football association was having an event. We actually got one each but we gave away one of them to a kid we met somewhere in Georgia. The other one has been our mascot and has been riding with us over mountains and through deserts hanging on Wejs handlebar bag. We had hoped we could bring this friend with us to Bangkok and we are sad to have lost her, but we hope she will continue traveling happily on her own. We have had warm feelings for friend one and two, but unfortunately the same can’t be said about friend number three. Although we have had no feelings for each other, friend number three has played a crucial role during this trip, but now time caught up with him and he died in front of that tunnel after a 16.000 km long and dutiful service. It has happened that we have yelled at our friend and been disappointed of his performance, but he has never complained. He has just kept rolling and rolling until he was punctured so severely that a pen could be put through his thick black skin. 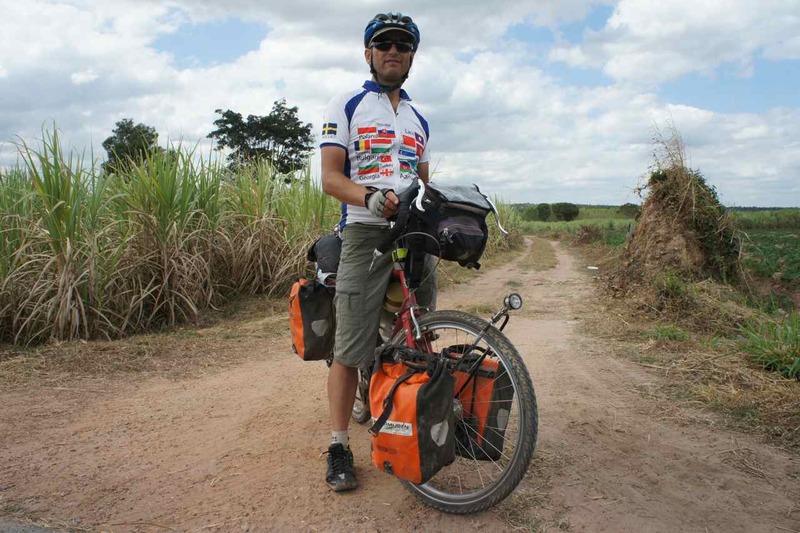 If you didn’t already know it I can tell you that this trip between Göteborg and Bangkok is carried out by bicycle and I will take the opportunity to mention a few words about the last two weeks cycling experience. 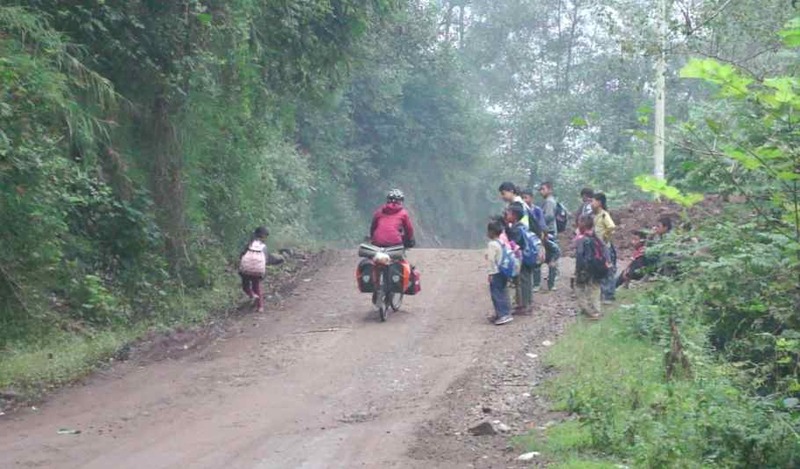 The ride from Chengdu to Leshan was very different from the previous weeks on the east tibetan plateu. 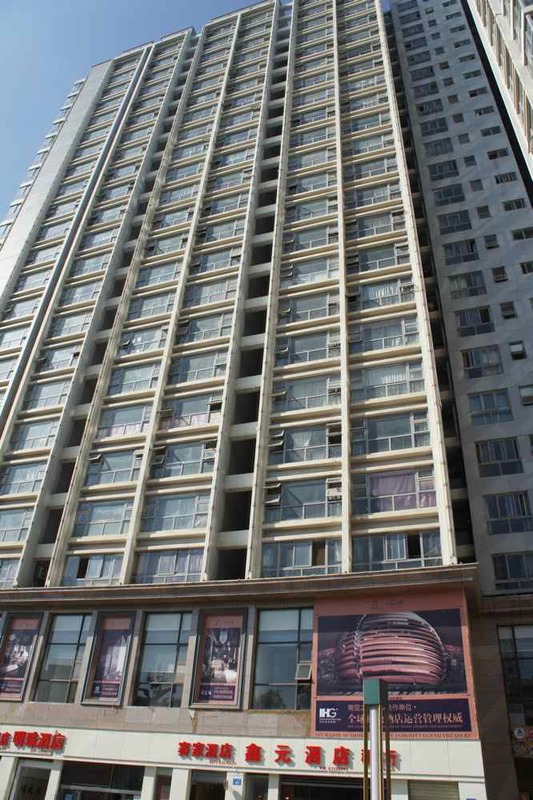 Chengdu is located in the lowlands below the mountains and this area is very densely populated. 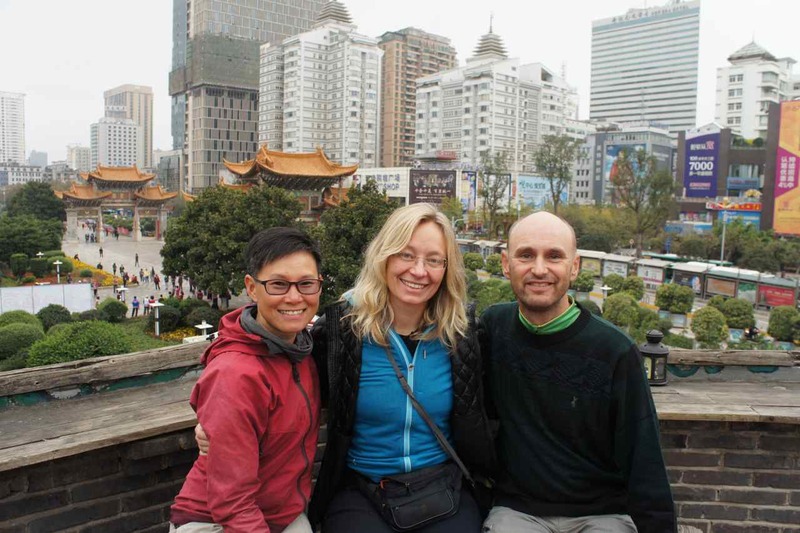 We took a small road the 160 km from Chengdu to Leshan where we would apply for extension of our visas. This small road passed a village – yes you read it correctly A village…. Although being on a small road on the countryside we hardly saw any fields or forests. There were buildings along the road all the way from Chengdu to Leshan and it felt like we were riding through the world’s longest village. 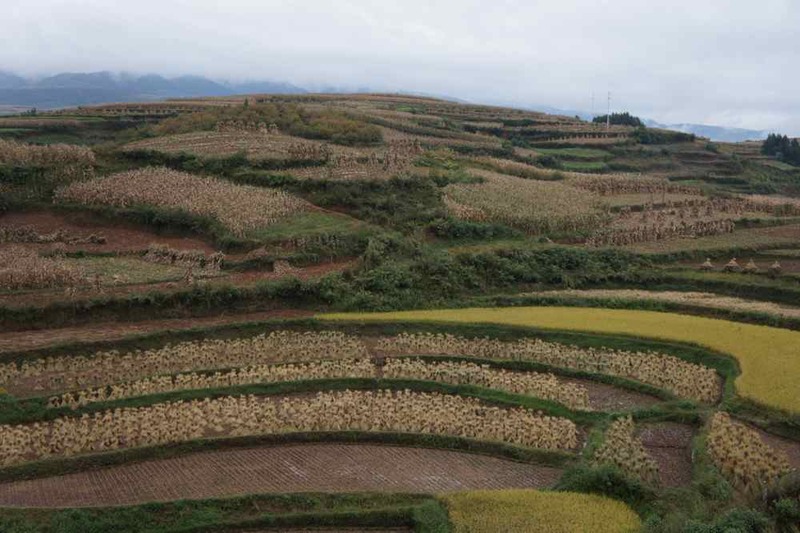 Of course it was many villages that had grown together and behind the single row of houses that lined the road we could see the fields of rice and corn. Seeing so much people, houses and activity was very different from our experience during our ride through the east tibetan areas. Being on the east tibetan plateu was a cold and sometimes wet experience. 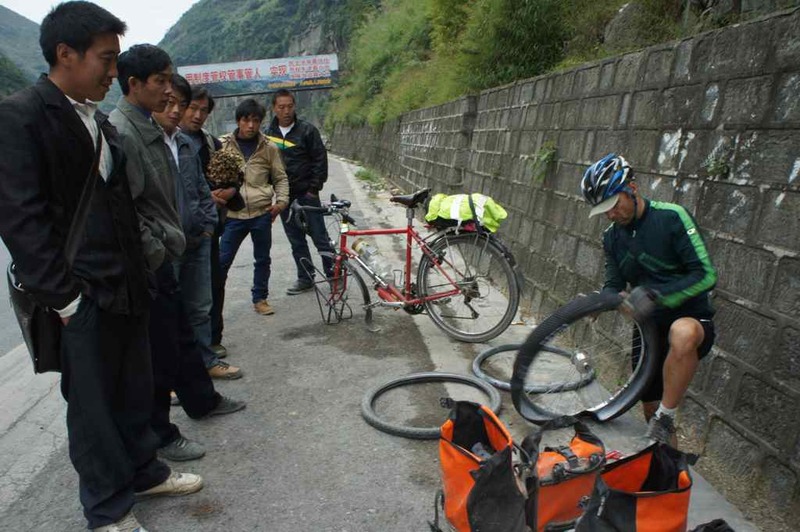 In the lowland between Chengdu and Leshan we could finally cycle dressed only in shorts and T-shirts again. We had looked forward to it and enjoyed every second of it. We have followed road 213 for a couple of weeks now. It’s a long road that seems to cross central China from north to south. 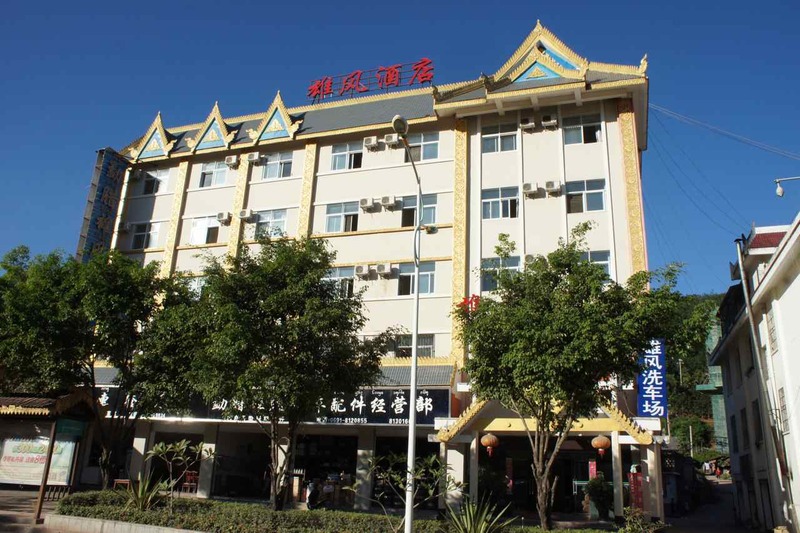 We have been on and off it since we bypassed Lanzhou. We left it somewhere outside Chengdu but south of Leshan we joined it again. Road 213 is a good road with a perfect surface and it has been a joy to cycle on it. 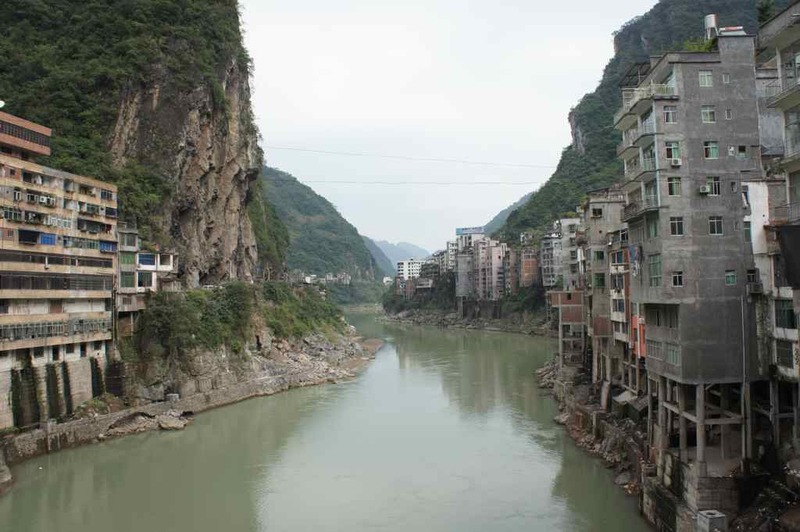 Two days after leaving Leshan we arrived to a small town outside the city of Nananzhen that is located where two tributaries to the Yangtze river merge. 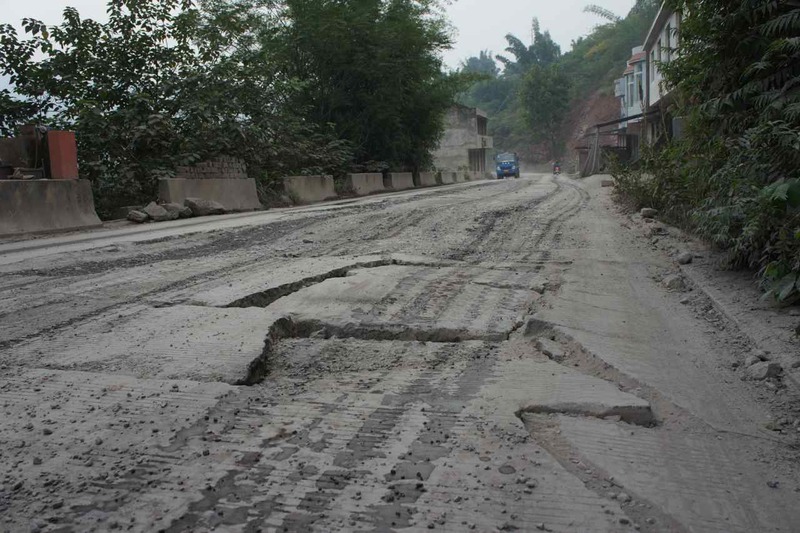 The good old road 213 was in a poor condition here due to being severly damaged in the Sichuan earthquake a few years ago. 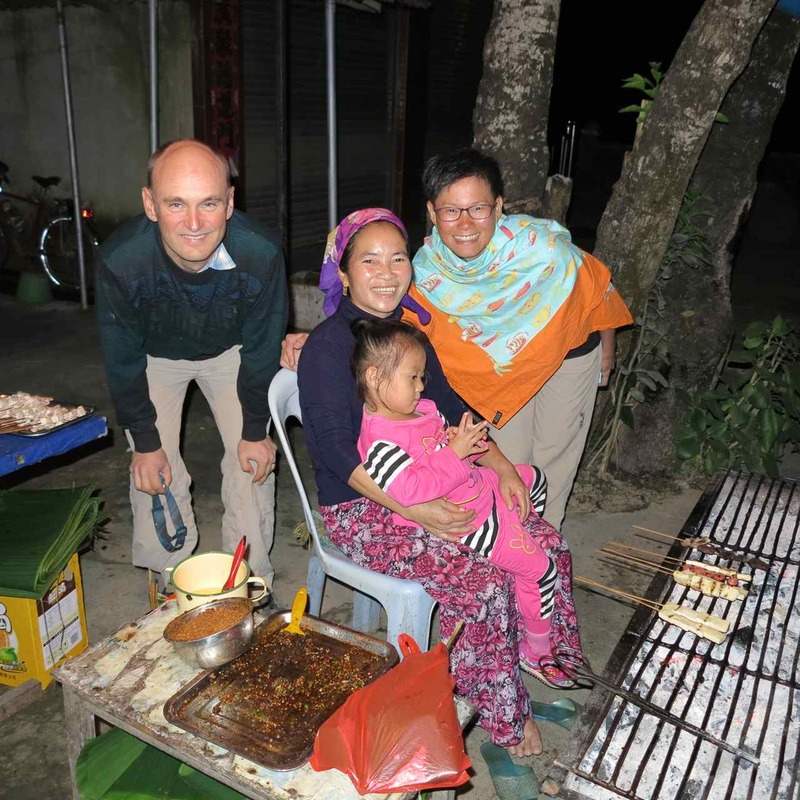 We stayed one night at a hotel in the unlit village outside Nananzhen. When we went out to find somewhere to have dinner it was a compact darkness and a very dense fog. 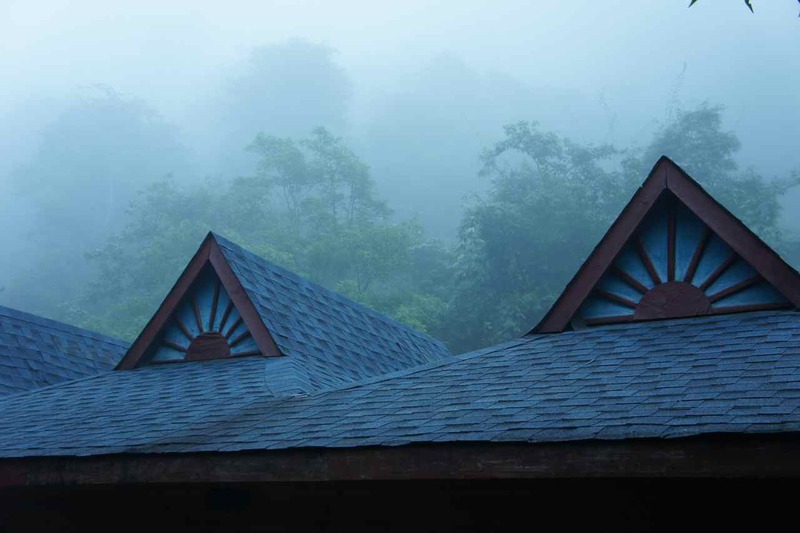 It was foggy in the morning too, but at least it wasn’t dark and road 213 had been repaired so we could make some quick progress until we would start a 1500 meter climb over a mountain. We had checked both our printed map and online maps and road 213 was now going to take us up on the mountain and when we arrived to a T-shaped intersection in a town before the switchbacks we were a bit unsure about which way to go so we asked a police officer for help. He spoke no english but his body language told us that he thought it was a really bad idea to go on road 213. We soon understood why…..
After that T-intersection road 213 turned into a very poor dirt road with big potholes and lots of loose rocks on the surface. We were surprised to say the least. On the map the road looked like it had looked all the time with the same size, colour and number, but here it turned into what could best be described as a dirt road for tractors in a forest. First we thought that the condition of the road was temporary and it would get better later on, but after a while we realized that road 213 has a complex and split personality with different charachteristics….. When we realized that the road wasn’t going to get any better and we would be slowed down significantly we were disappointed for about 30 minutes before starting to enjoy the unexpected adventure that fate had brought upon us. 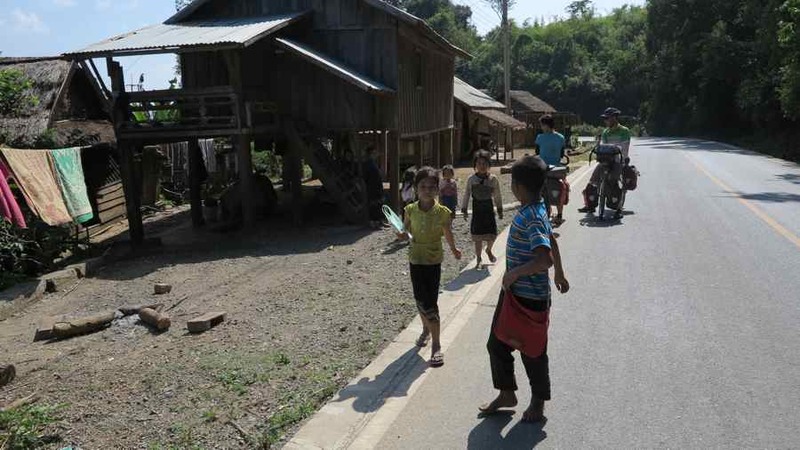 We passed small villages and met many groups of curious kids on their way to school. Just like the kids in central asia they ran after us trying to talk to us using the few words in English they know. Being followed by curious kids is something we got used to in central asia but had yet to experience in China. In the late afternoon we understood we wouldn’t make it over the mountain to the next town so we decided find somehwere to pitch our tent. 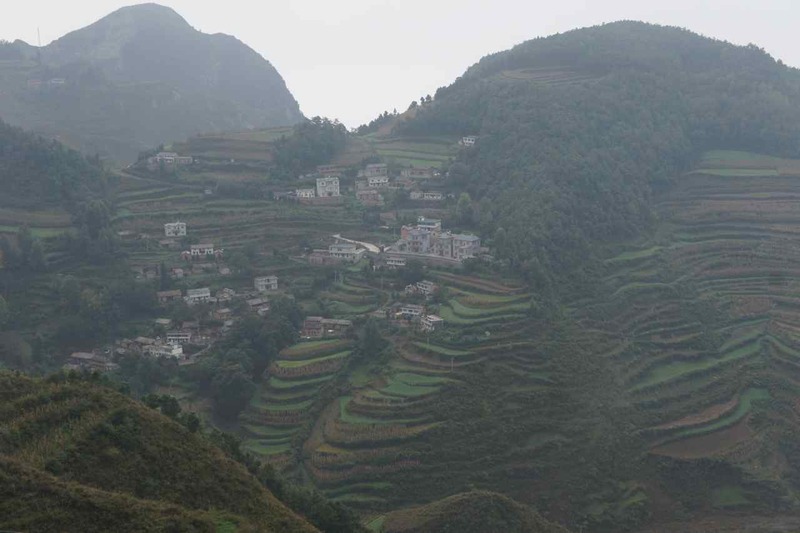 To find a place to camp is difficult in an area that is so steep that people have to make terraces on the hillsides to get some land to grow rice on, build their houses or park their cars. 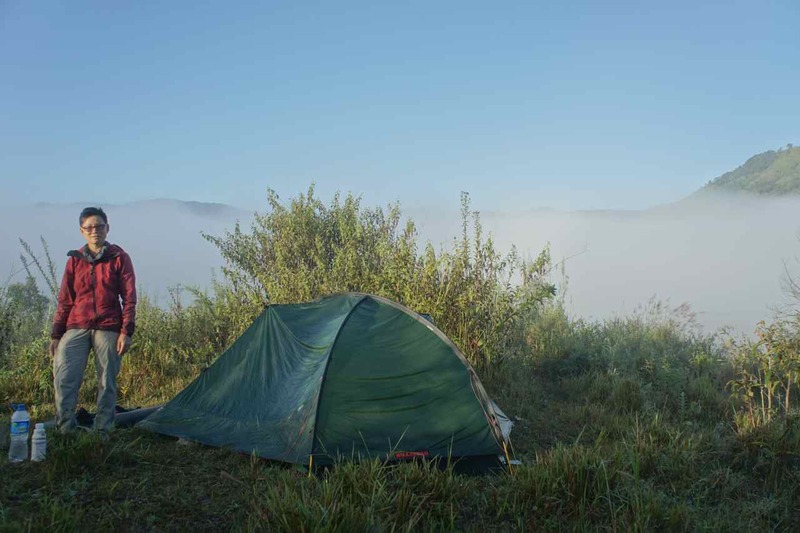 When we camp we have a security related rule that is that either nobody sees us or knows where we are or lots of people are aware of our presence. We try to avoid being seen by only one or two people. So what to do when there is nowhere to pitch a tent and there are people around, but too few to be called ”many”? We found two spots immediately beside the road that could serve as a far from perfect tent spot and then we waited to pitch the tent until it got completely dark. 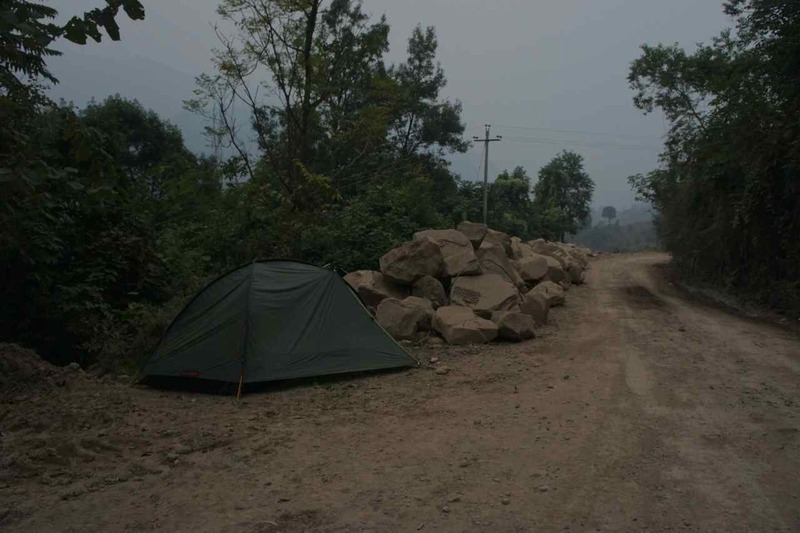 Our tent was next to some big boulders less than 3 meters from the road and although some cars, motorcycles and even pedestrians passed us nobody noticed the tent. One man walked along the road talking loudly on his cell phone and pointed his torch light right to our tent, but didn’t seem to see it. A very good indicator of how bad condition a mountain road is in is when it isn’t possible to cycle faster downhill than uphill. Our average speed up the mountain was about 7-8 km/h and it wasn’t faster on the way down….. Both of us got blisters on our hands from all the breaking on the way down. A few hours later on the second day on the mountain we got a glimpse of a good looking road in the far distance. After a quick look on the map and we realised that it must be our road… 🙂 It was an adventure on the mountain but we also looked forward to get back on a nice road again. When we had descended to the road we realized one problem and that was that the good road was missing on maps and seemed to go to the east instead of south towards the next set of switchbacks. We soon came to a 4 km long tunnel that was neither on the printed map, nor on the online map. We thought this tunnel was a new one and that it would bypass the next steep climb by going through rather than over the mountain before re-joining road 213 after the mountain pass. We entered the tunnel that was downhill and after speeding through we took a look at the GPS that told us we were not on any road, but indicated we were far off where we had planned to go. Not very tempted at going back uphill through a long tunnel we stopped to re-plan our route. The road we were on was too new to be on any map but it seemed it would take us straight east to a motorway that is parallell to the road we planned to ride. We have had enough of motorways and decided to go on a smaller road parallell to the motorway. There were two major towns on this small road and there was a lot of traffic on the 20 km between them. After passing the first town we witnessed a very chaotic situation. Two trucks traveling in opposite directions had crashed into each others side and blocked the road completely. It wasn’t a serious crash and the damages were minor, but they had to be removed before the traffic could flow freely again. The line of cars waiting behind both trucks grew quickly and were soon several kilometers long. Instead of lining up properly behind each other and leaving the lane for the traffic in the opposite direction free, the cars and trucks waiting on both sides started to overtake each other to get to the front of the line. This meant that the road was completely blocked on both lanes in both directions and rescue vehicles had big difficulties to access the two trucks. The road looked like a giant car park and we had to go zig zag between cars that had parked on our side of the road. Once past the last cars waiting we speeded on trying to get as far as possible before the traffic was let on again, but only a few cars came. We think that they still may be parked on that road trying to sort out who to back out first…. This situation was interesting from a cultural perspective. Nobody seemed to think the thought that if I overtake the car in front of me there won’t be any space for me to get back in again and I will be left blocking the opposite lane causing everyone to get stuck, but since everyone is doing this I can do it as well. To me this was a real life example of the philosophical terms ”tragedy of the commons” and ”prisoners dilemma” (google if you don’t know them). 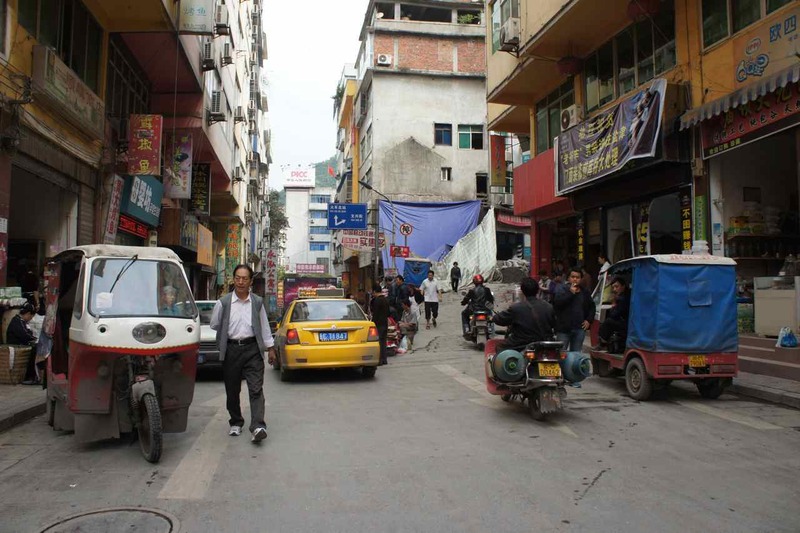 An hour or so after the chaotic situation we entered Yanjim which probably is the world’s most narrow town…. 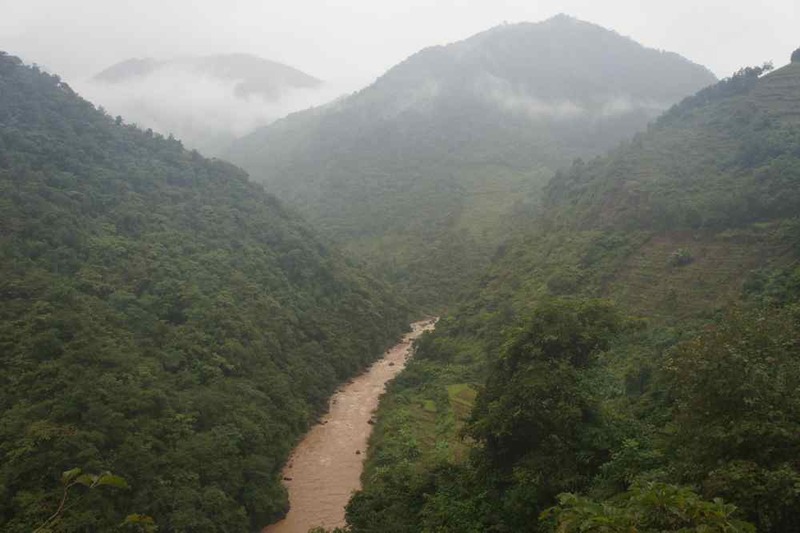 The town is located along a river that flows between high mountains with very steep sides. Yinjin has two parts, one on each bank of the river and there is no flat area since the town is literally built onto the mountain sides. The side we stayed at had two long major streets with steep alleys or staircases leading towards the apartment blocks where people live. Parking on the street was impossible and many buildings had a garage on the street level. We had to squeeze our bikes under a stairway in the combined hotel and apartment block that we were staying at. 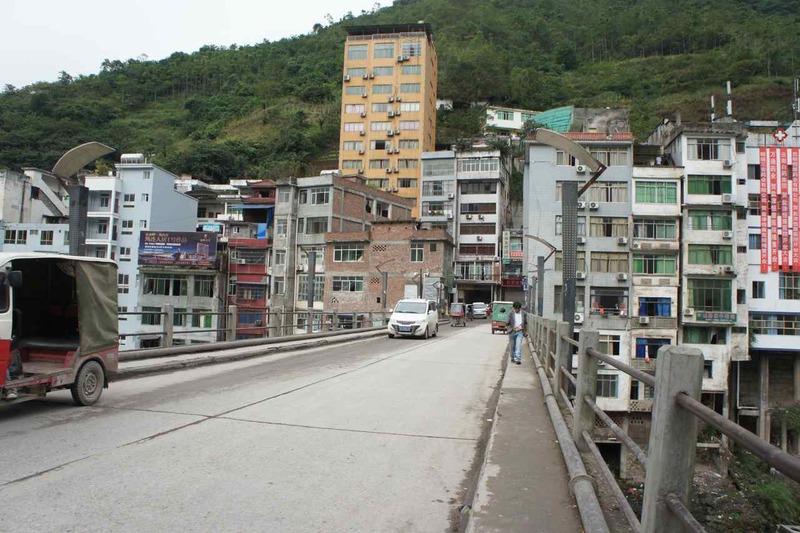 The hills are right behind the few line of buildings in the world’s most narrow town. Although the city had so little flat area the two main streets were very busy with fancy boutiques, restaurants and shops side by side. Yinjim is probably not known for anything but I’m glad we came here and I will remember it for its very unlikely location. The busy far end of the main street in the world’s most narrow town. It had been good weather with nice temperatures but with some haze all the way from Chengdu to Yinjam. When we left Yinjam the temperatures dropped and we could see how dark clouds got into attack position. We got one more day with a grey sky but then we had rain most of the time all the way into Kunming. Since it rained and the beautiful views were blocked we decided to go on the motorway to get some kilometers done. 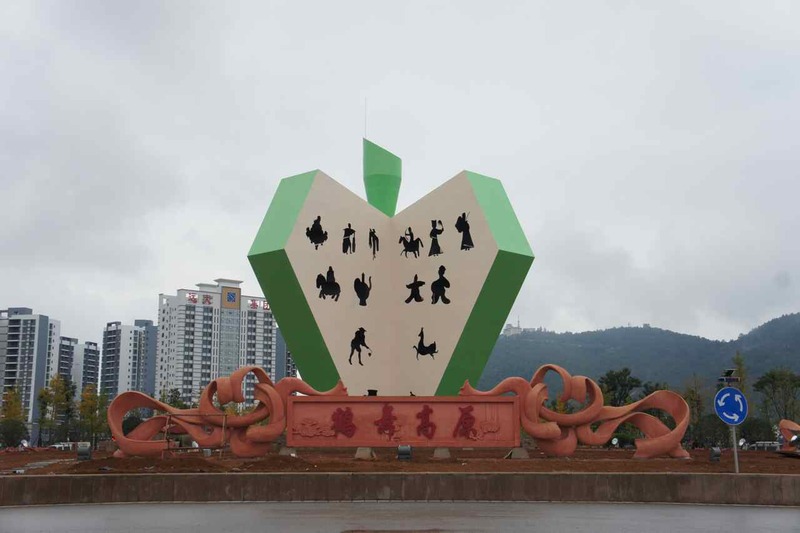 Chinese people like to refer to Kunming as the city of eternal spring. 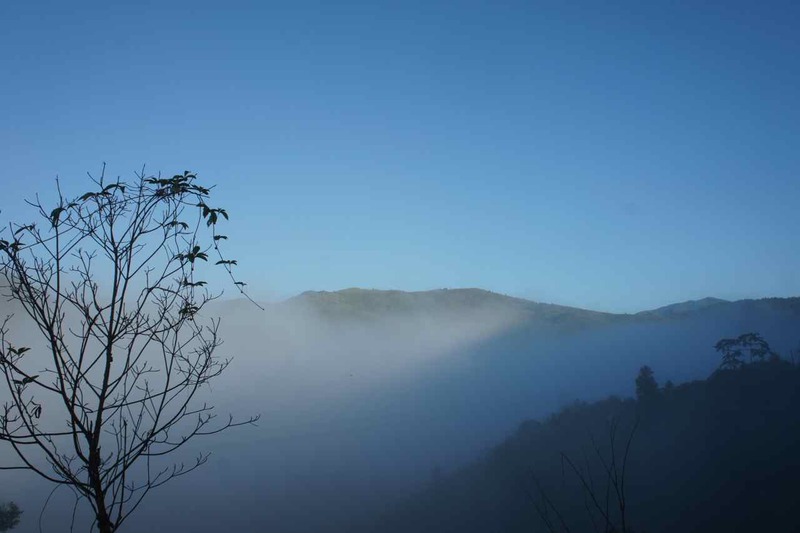 It is located at 1900 meters altitude and being only 250 km from the tropic of cancer which is where the tropical zone of the world starts it is supposed to never be really cold but have a pleasant weather throughout the year. Not so when we visit though – the temperature has ranged between 7-13 during three last days into Kunming and now when we have been in the city for three days already we feel like we are back in Göteborg. This kind of weather is what we are used to back home at this time of the year and never did I expect to experience the same weather conditions only three cycling days before crossing into the tropics. 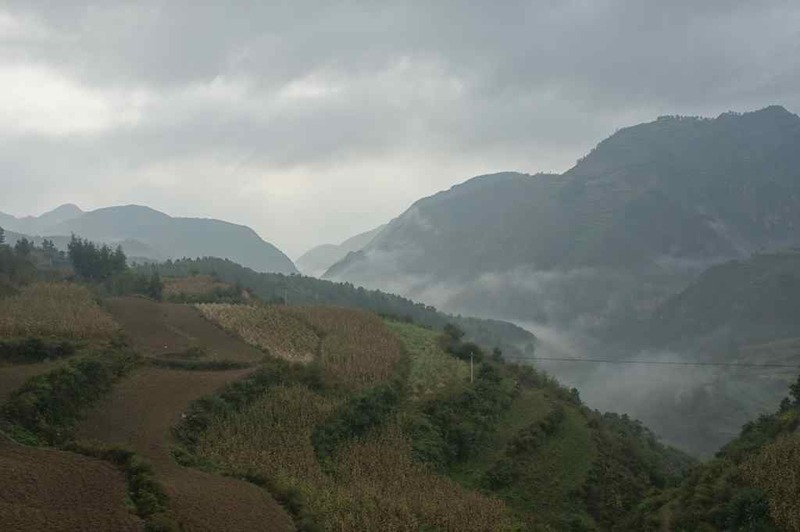 For more photos of our trip from Chengdu to Kunming, take a look at Wej’s most recent blog post. She has put in a lot of photos there. This entry was posted in Posts in English on October 23, 2013 by admin. A few weeks ago we asked all of you who follow this blog about advice for which route to take when entering Thailand. We got many interesting opinions both as e-mails and as comments directly on the blog. 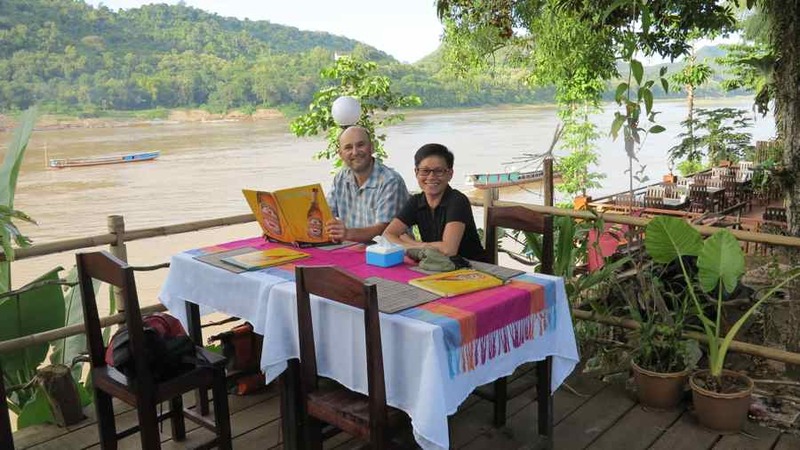 After having put the question on the blog we started to discuss the issue intensively among ourselves and it seemed that both of us were more interested in going west after Luang Prabang and enter Thailand in the northern province of Nan. That route is more rough, not very populated and certainly less traveled. 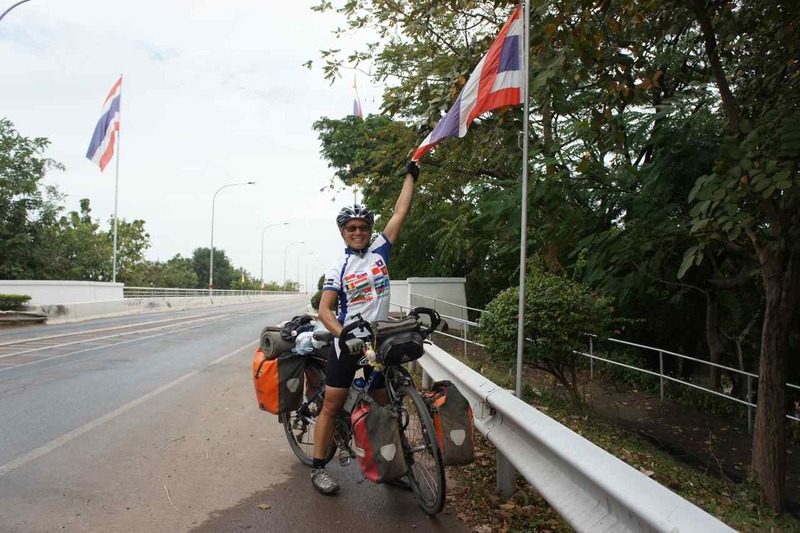 We felt that going this way would be the last stretch of adventure we would get before entering Thailand where we will have a comfortable ride on good roads with friends accompanying us most of the way to the finish line. 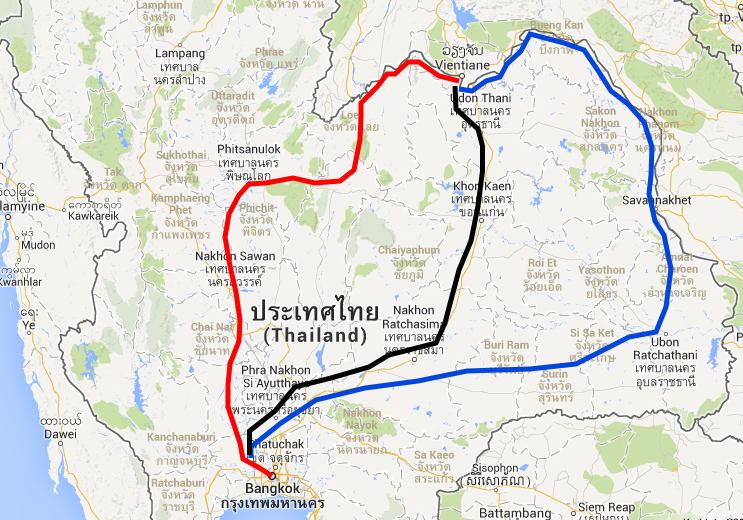 Entering Thailand in the north would also mean that we could pass Chiang Mai where we know a lot of people. It is also Loy Krathong festival on November 17th and it would have been interesting to celebrate it there. 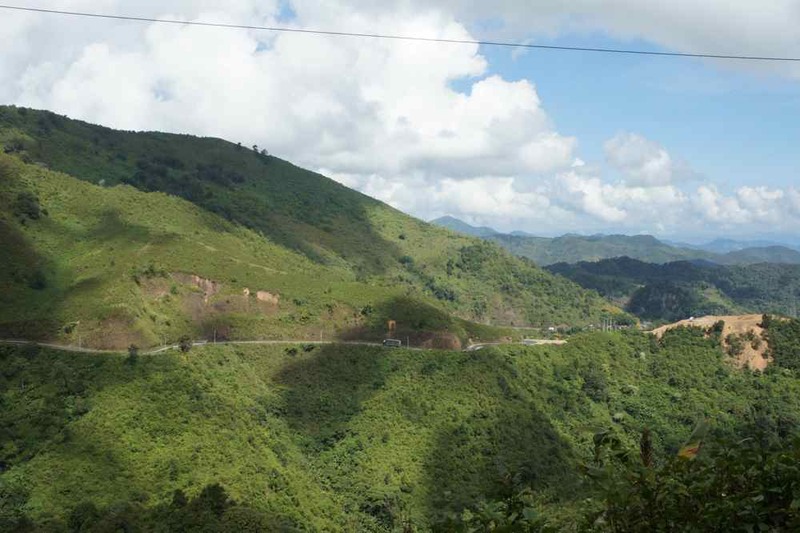 However, the decision is now made to take the route straight south from Luang Prabang and enter Thailand by crossing the Mekhong river on the Friendship bridge between Laos’ capital Vientienne and the city of Nong Khai on the Thai side of the river. It is not an active decision to take this route, it is an effect of bureaucrazy….. When we learnt that China changed its visa laws we heard rumours that it would be increasingly difficult to get an extension. We have two Swedish passports each and quickly developed plan A and B. Plan A was to apply for extension as usual and hope for the best. Plan B was to get a new visa outside China. The new chinese legislation is that one has to apply for a visa at the chinese embassy in the home country, in our case in Sweden. We prepared all required documents and sent them home to Göteborg together with the passport we currently don’t use. If the extension wasn’t granted, we would quickly leave for Hong Kong while an application for a new visa was being processed back home and then delivered to Hong Kong by courier. It would have been a costly and 10 day long detour but we were prepared for it. When we applied for extension we were a bit nervous and extremely happy when our applications for extension were granted. Wej will use her Thai passport when entering Laos and Thailand and doesn’t need any visas for these countries, but the passport I currently travel on has too short remaining validity to be able to use for an application of a visa to Thailand at the Thai consulate here in Kunming. The passport that I sent back to Sweden is valid for another four years and since it is already in Sweden I thought I could just as well apply for a Thai visa at the consulate in Göteborg. This has now been proven to be extremely complicated. Both the Thai Embassy and consulate in Sweden requires paid (not only booked) air tickets (bus tickets won’t do…) in and out of the country. Having cycled this far we are certainly not interested in getting even a 5 minutes flight (there is no such flight anyway) across the Mekhong river and we don’t know yet what day we will return and thus haven’t bought any return tickets. I have e-mailed the embassy and the consulate to ask for an exception but only got a polite answer that they have to stick to their rules. Fortunately, Thailand doesn’t have a uniform visa application procedure for its embassies and the embassy in Vientienne in Laos doesn’t need anything else than the usual application form, photo, passport copy and payment to be able to grant a visa. My passport that is in Sweden will be delivered to me next weekend and now when it has proven impossible to get a Thai visa in Sweden for crossing the land border, I will have to go to Vientienne in Laos to try my luck there and this means that the route west from Luang Prabang towards Chiang Mai is not an option anymore and we will have to enter at Nong Khai whether we like it or not. The struggle to get a visa has been a recurrent issue during this trip. Getting visas to the ex-soviet countries in central asia is known among travelers to be extremely complicated since it costs a lot of money and a lot of patience is needed. Getting a visa to Thailand is supposed to be very simple but unfortunately it wasn’t in my case. As a friend and warm supporter of Thailand since almost 30 years I must say that it saddens me to note that getting a visa from Sweden to enter and exit the Kingdom across its land borders is more complicated and expensive (need to buy air tickets that won’t be used) than it was to get my visas for Azerbaijan, Kazakstan, Uzbekistan and even China. However, one of the things I like with Thailand is that things are never too serious and life is a bit ad hoc. If the Thai embassy in Sweden has very formal rules, it seems that the Thai embassy in Laos is much more relaxed and getting a visa there will most likely not be any problem. We expect to get my visa for Thailand on Friday November 15th and cross the bridge into Thailand in the morning on November 16. The plan is to finish this long journey in Bangkok on Saturday November 30 and now we only have to decide which route to take from Nong Khai to Bangkok. 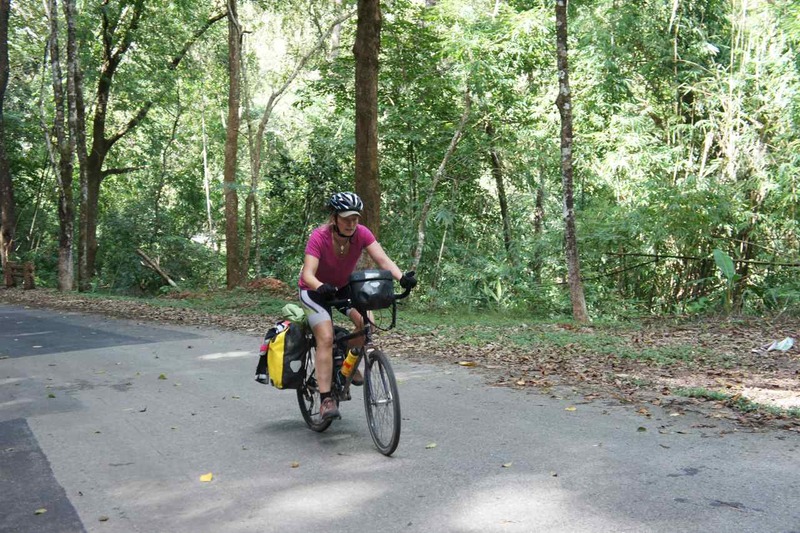 We are working hard on this issue and hope to publish an update about the route through Thailand within a few days. If you do have any suggestion, please leave a comment. This entry was posted in Posts in English on October 22, 2013 by admin.